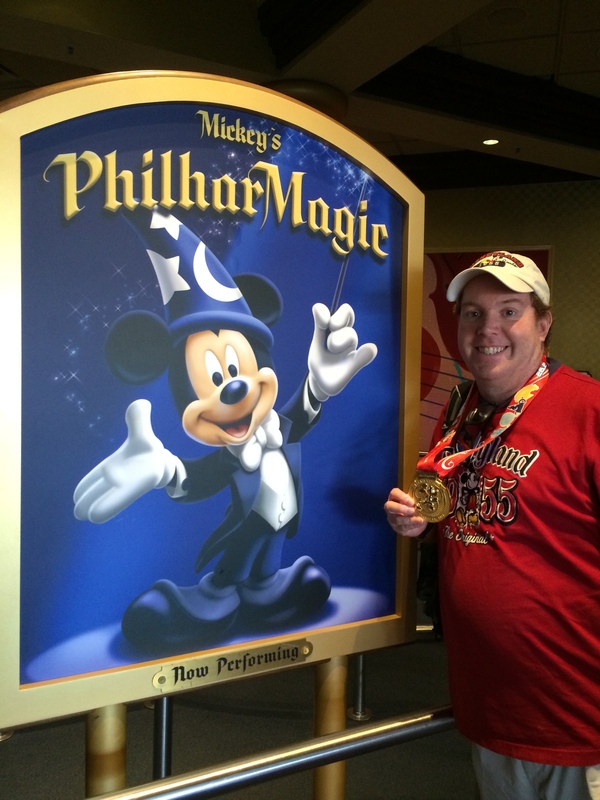 For me, this day on the Walt Disney World Marathon Trip was the biggest unknown. 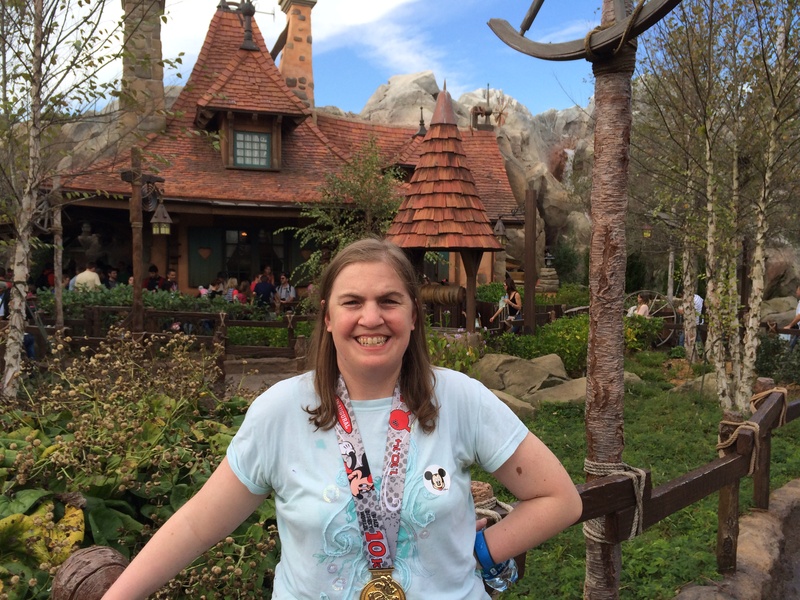 After spending over 6 hours to cover 26.2 miles, would my body actually be able to handle a day at a theme park? 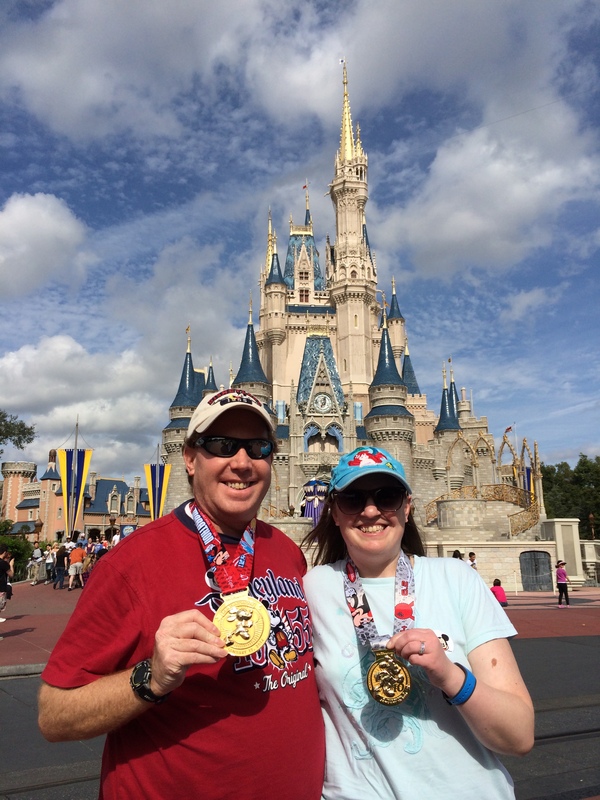 Well, not only was I able to handle a day at a theme park the day after the marathon, but Brooke and I spend over 12 hours at the Magic Kingdom without any feelings of pain from the marathon. As a matter of fact, I felt so good, it was like I didn’t run a marathon the day before. How crazy is that? The day didn’t start off too early. However, because we had a fast pass set up to meet Ariel in the morning, we couldn’t just have a lazy morning either. 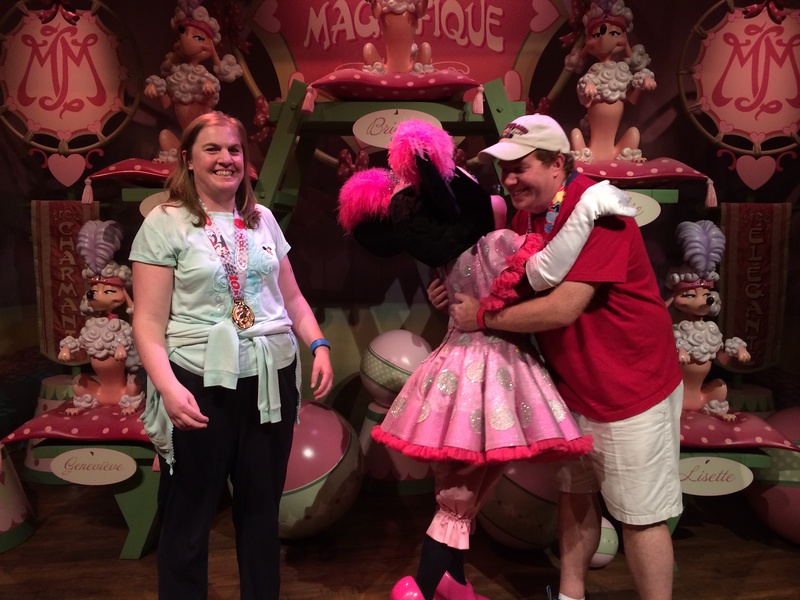 Plus, we were going to the Magic Kingdom! Before boarding our Disney bus to the Magic Kingdom, we did make time for breakfast. 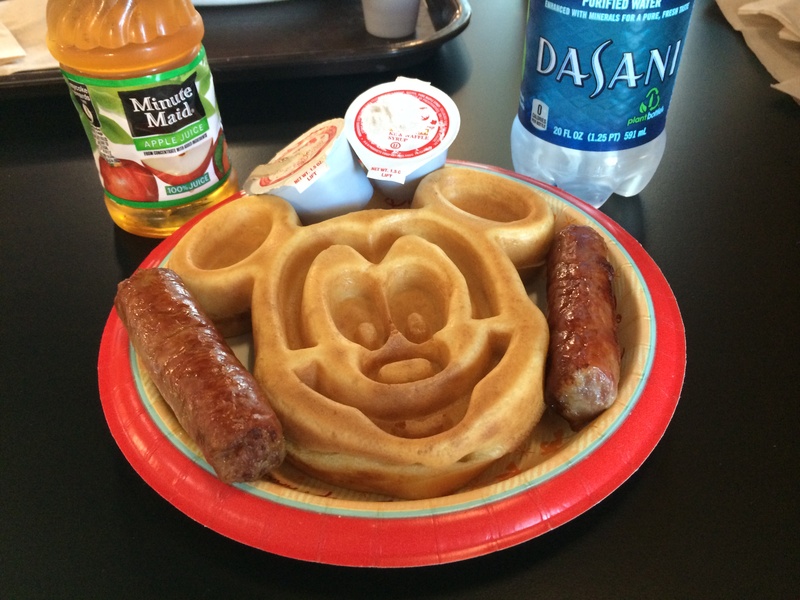 A Mickey waffle sounded perfect for this morning. It was much better tasting than the bagel I had the morning before. 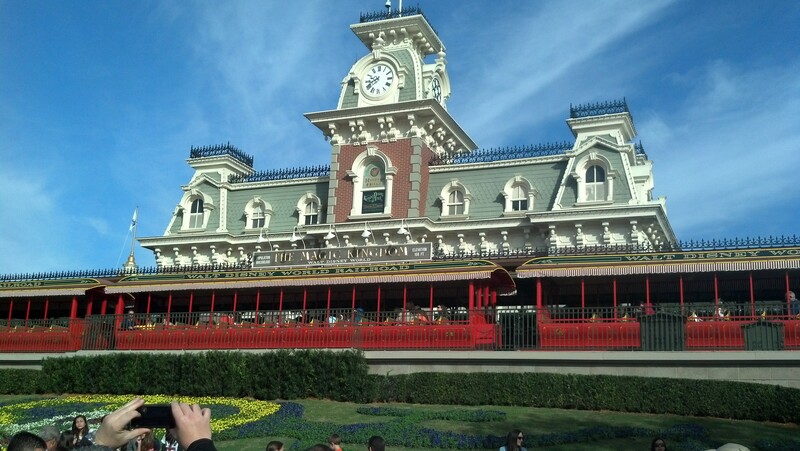 After breakfast, we were off to the Magic Kingdom. Main Street U.S.A. at the Magic Kingdom looks pretty similar to its counterpart in Anaheim. Except for the fact that Cinderella’s Castle hovers over it. 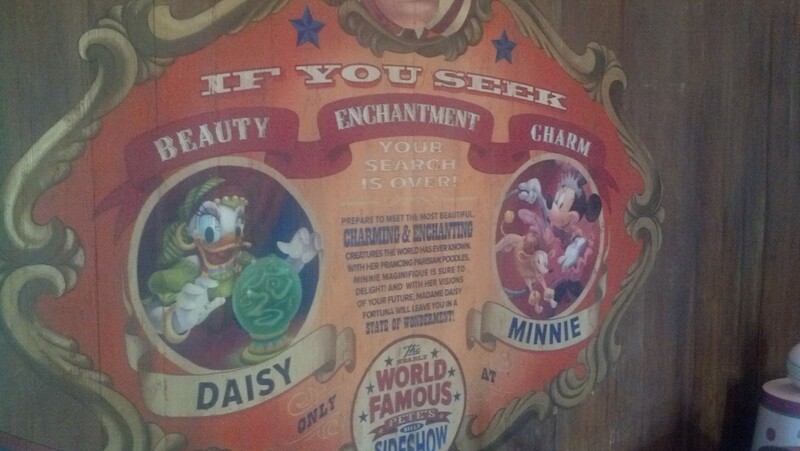 The only shop that seems to be in place is the Emporium. It was super exciting to run up this street the day before and was still magical walking up it a day later! 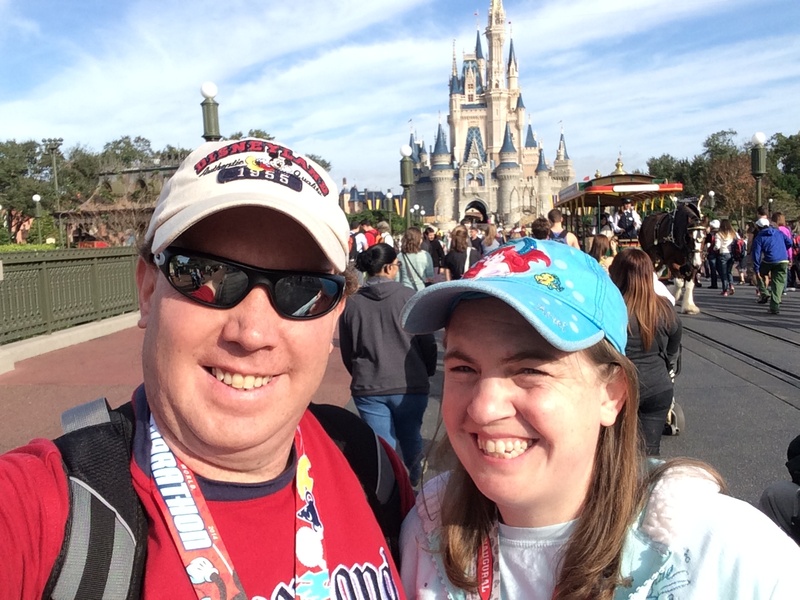 At the end of Main Street U.S.A. we had to take this selfie with Cinderella’s Castle in the background. I have mentioned this before on my blog and I’ll say it again, I absolutely hate it when people call Sleeping Beauty’s Castle at Disneyland small. I get it. Cinderella’s Castle is bigger. It’s just that so many people make such a big deal about the size of both castles that it bugs me as a Disneyland fan. 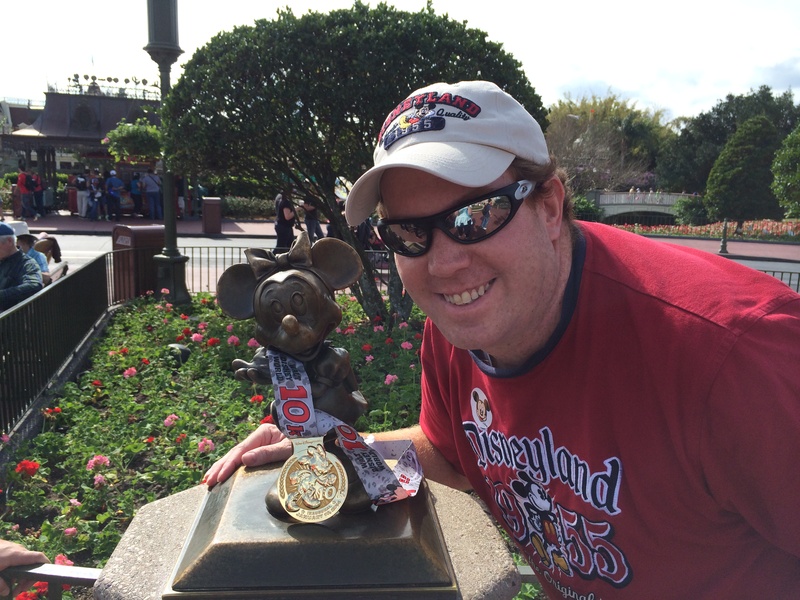 I love both the Magic Kingdom AND Disneyland. They are both great fun to be at. Even though I appreciate Cinderella’s Castle for what it is, I proposed to my wife next to Sleeping Beauty’s Castle. So, Sleeping Beauty’s Castle at Disneyland will always be more special to me. BOTH castles are amazing and iconic in their own right. 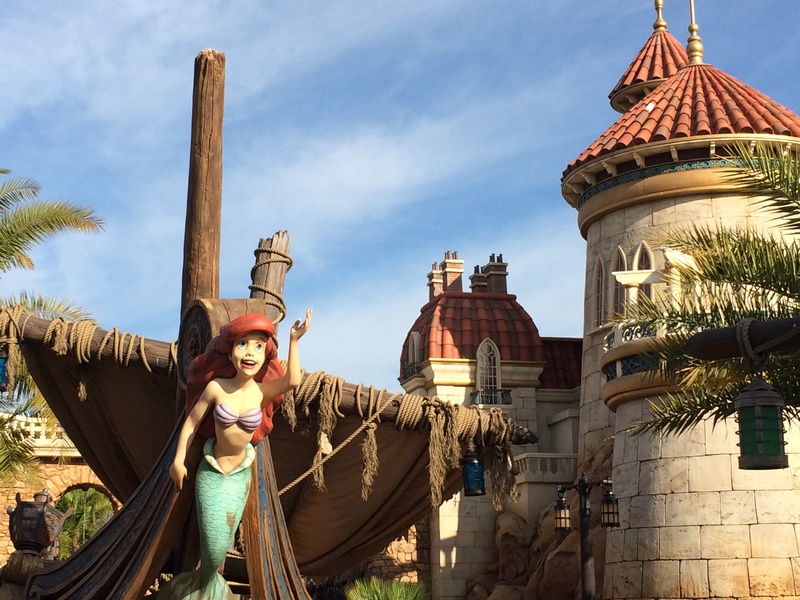 As we took our time admiring Cinderella’s Castle, we did still have to make it to our fast pass time with Ariel. 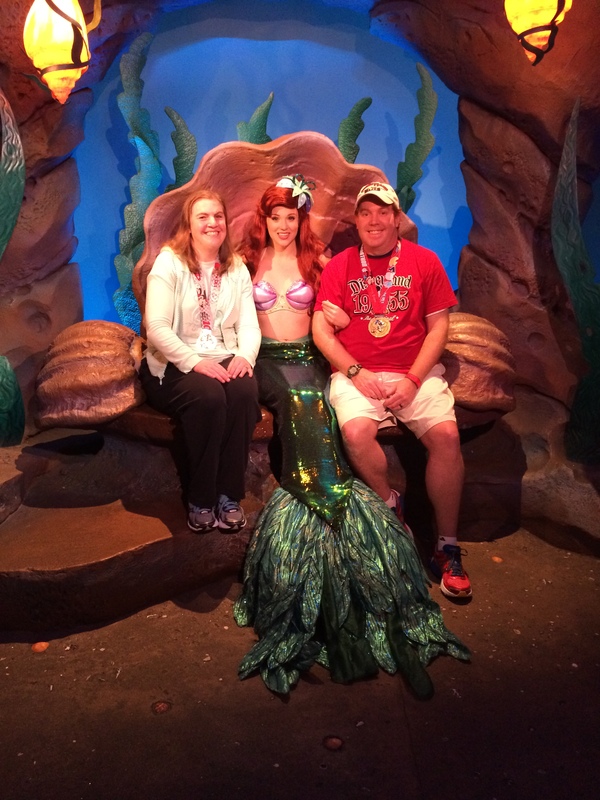 I scheduled this first because I knew Brooke would want to meet Ariel. It got our day off to a fantastic start and put Brooke in a good mood. 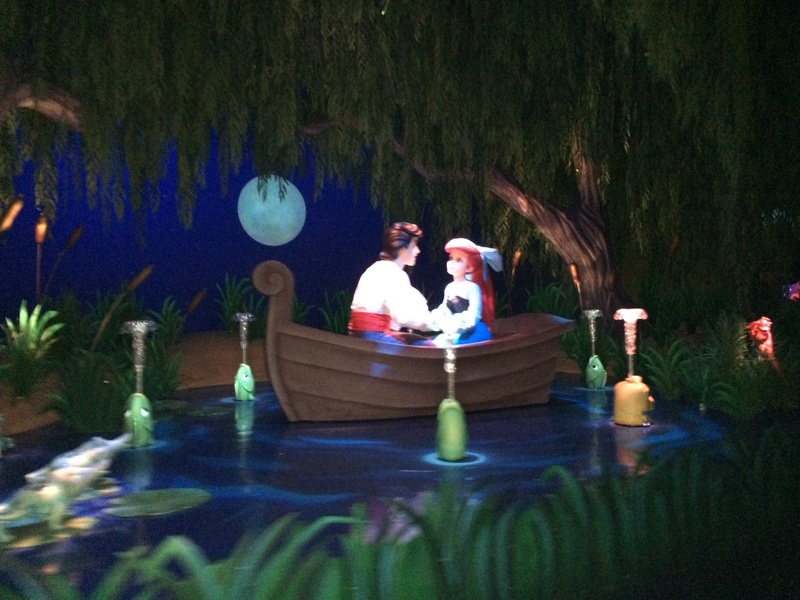 Next up was Under the Sea – Journey of the Little Mermaid. 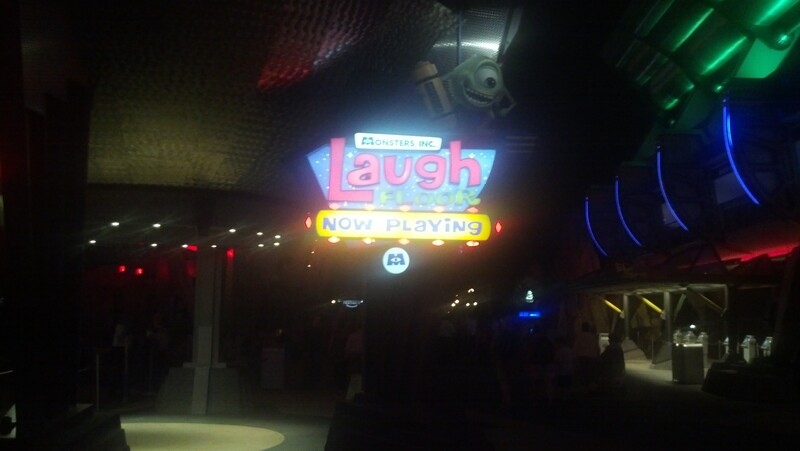 This attraction, with a slightly different name, is Brooke’s favorite at Disney California Adventure. 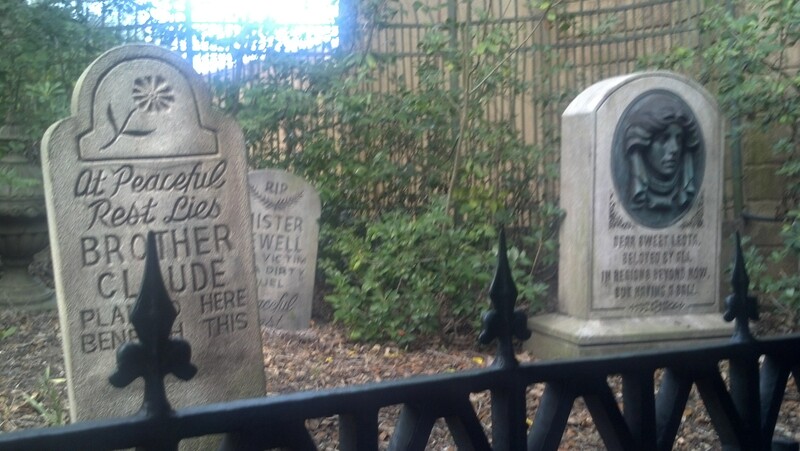 We had fast passes set up for this attraction as well. However, we finished up meeting Ariel quick enough that we decided to just get in the regular line because the wait was so short. I’m glad we did. 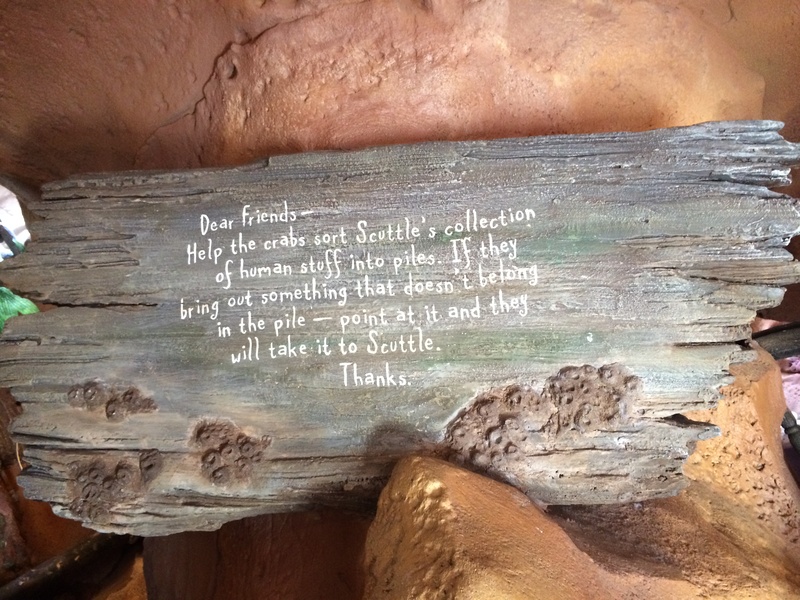 There are so many cool details in the queue line for this attraction. 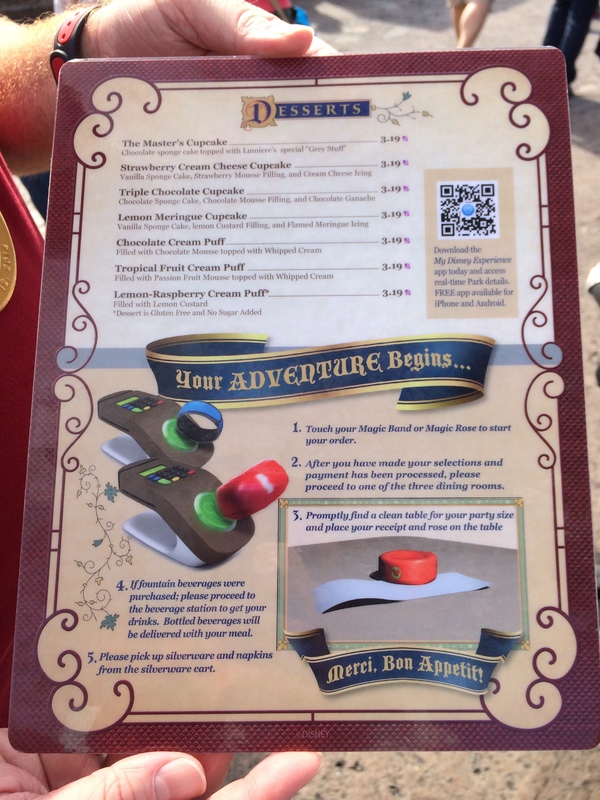 I love that they give you a scavenger hunt of sorts to help out when the lines are long. Although, I don’t think either Brooke nor myself were paying attention to find the human stuff for Scuttle. We were taking in all the details in this immersive queue line. The above is just one example of what you will find in the queue line. There were several times, where we just told the folks behind us to go around. We felt bad about holding up the line. However, we loved all the details they put into the queue line and captured a lot of it in pictures. I’ll spare you from having to see all of the pictures now. I should have a tab on this blog up where I’ll put all of my trip reports in one place (and in order) next week. When I do, there will be a link to my flickr account and you can see all of the photos if you’re interested. 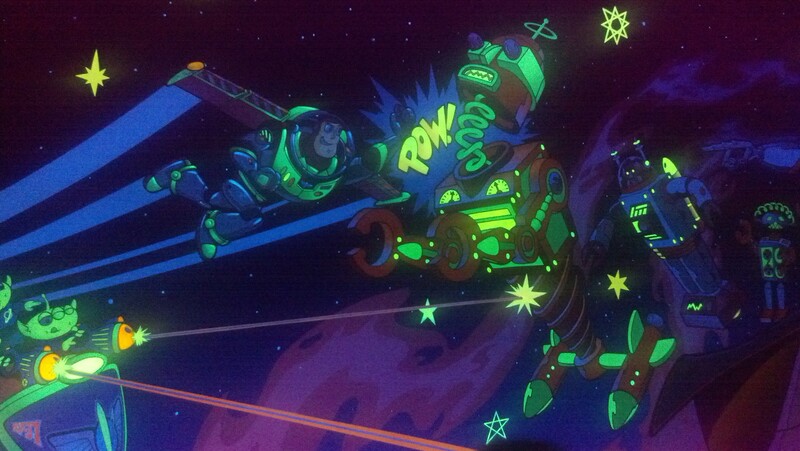 The mural in the background as you board your shell ride vehicle is slightly different from the one at DCA. 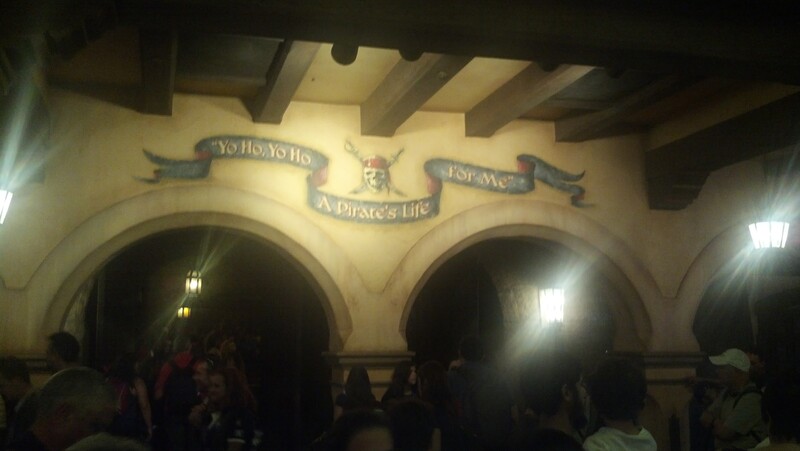 To be honest, both murals seem very appropriate considering the queue lines. 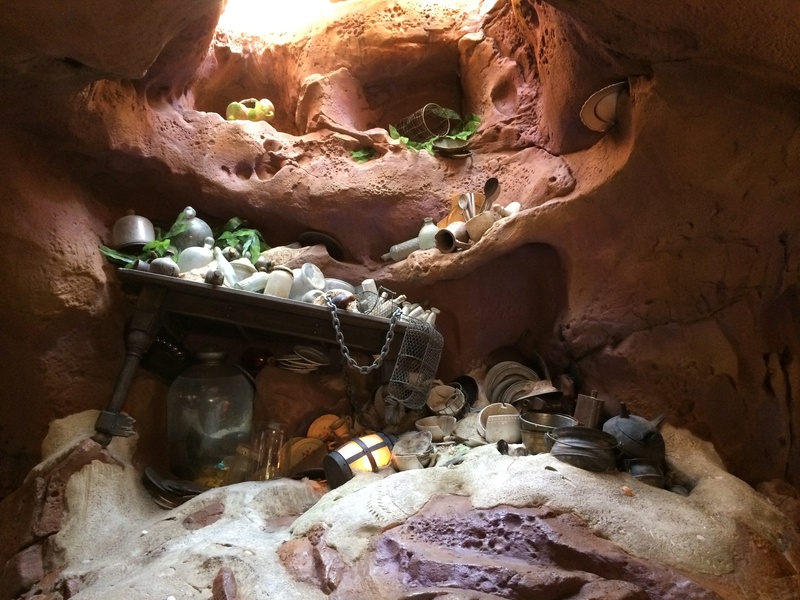 The line in the Magic Kingdom seems to take you into the caves. So, it’s a little more dark. The line at DCA is more open and the mural is more out in the sun. Both murals work well for their settings. 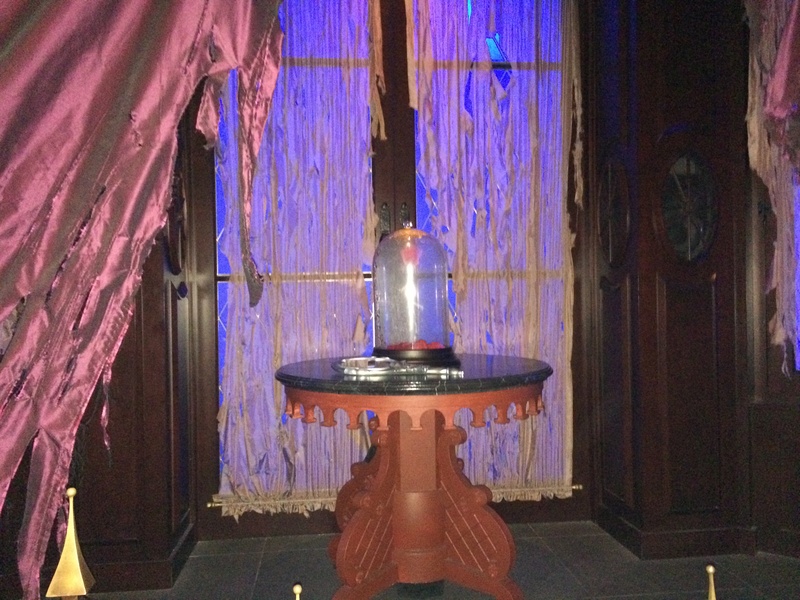 As for the ride itself…it’s almost an exact replica of the one at DCA. So, not surprisingly, Brooke loved this. 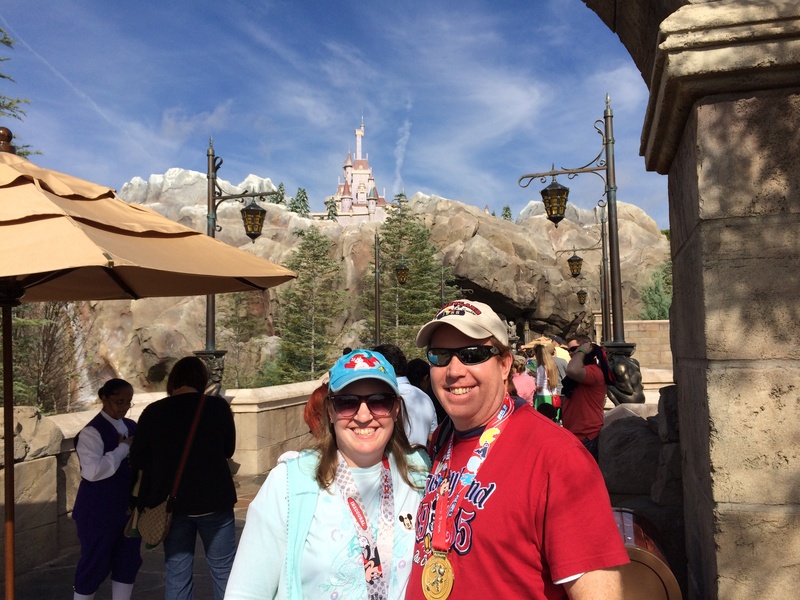 Since we still had some time before our fast passes at Under the Sea – Journey of the Little Mermaid, we decided to hit up another attraction in Fantasyland that we loved on our honeymoon…Mickey’s Philharmagic. Since we don’t have this show in Anaheim, it was great to be able to see it again. 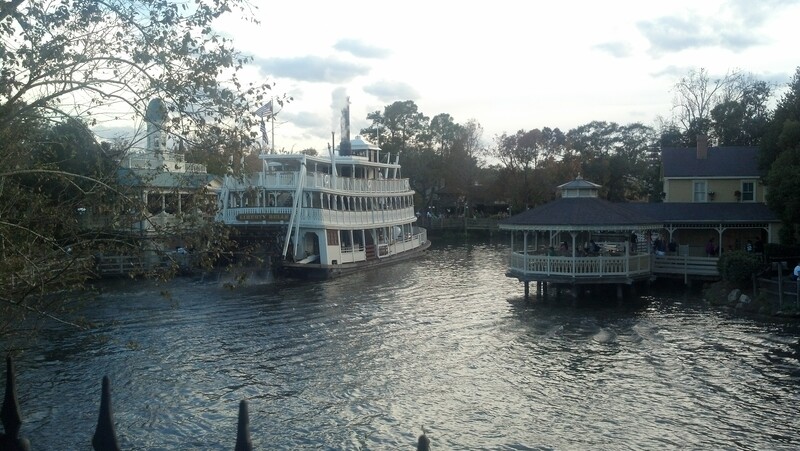 I’m sure if I came to the Magic Kingdom more often, it might get old. 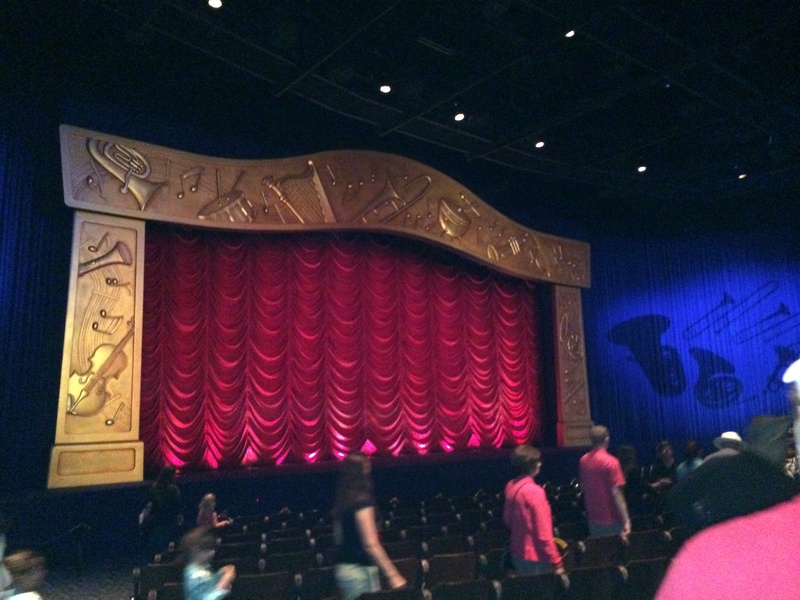 However, I love Mickey’s Philharmagic and wish they would bring it out west. After Mickey’s Philharmagic, it was time to make our way back under the sea to use our second fast pass for the day. After experiencing the ride with and without the fast pass, I would say that the experience without the fast pass was the best. Sure, the wait was less with the fast pass. 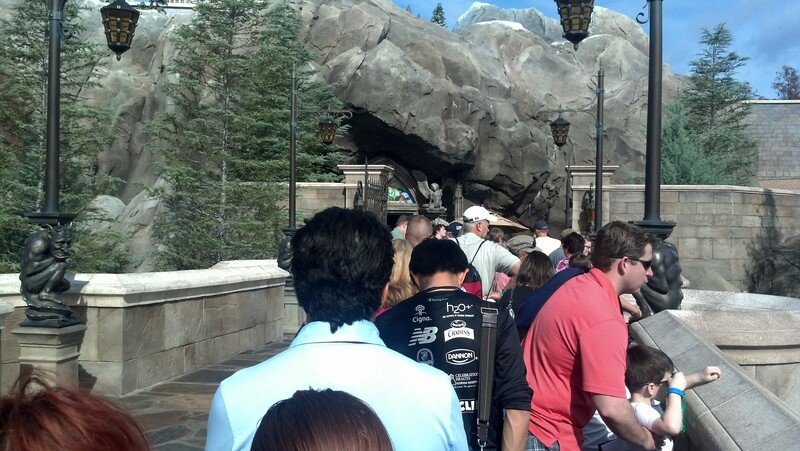 However, you skip over so much in a really fantastic queue line that I think the longer wait is worth it. 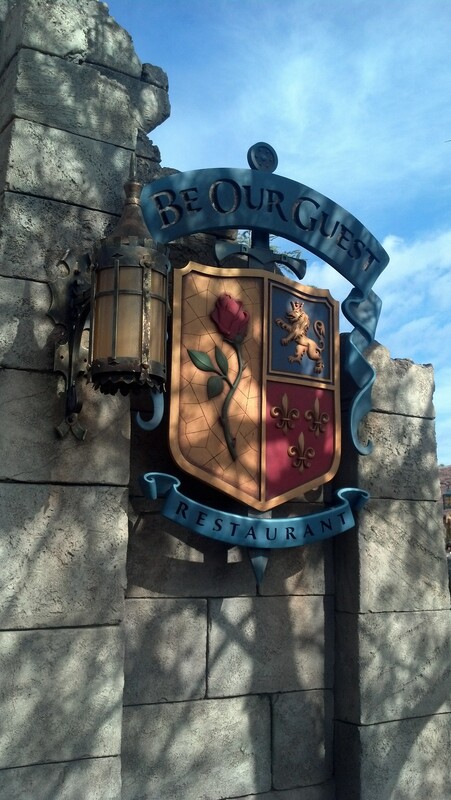 After going under the sea twice, it was time to get in line for lunch at the Be Our Guest restaurant. The line was already long at 11:30am and continued to grow. In planning this trip, it would have been great to do dinner here. However, I was too late to book a dinner reservation. (Hint: If you want to have dinner here, book at least 90 days from the start of your vacation) Lunch is not a meal you can make an advanced dining reservation for, however. So, we got in line and waited our turn. And the back. Since the Magic Bands are so new, I was really happy to see an explanation on how to use them at the restaurant. As you can see, the line just kept growing. 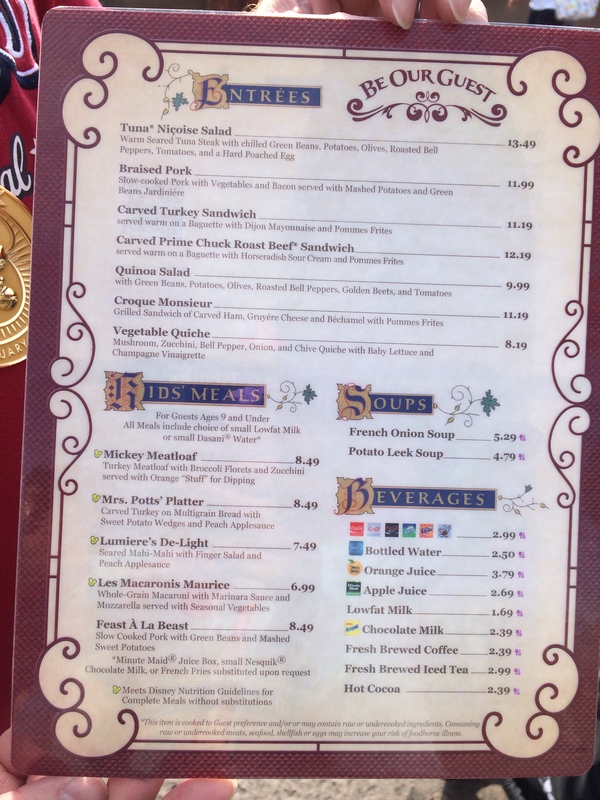 I had read that you should plan on arriving at the Be Our Guest restaurant between 11am and 11:30am for lunch. It was great advise. This is pretty much where we arrived in line. Some was nice enough to get this picture of us while we waited. The Beast’s Castle was in the background. 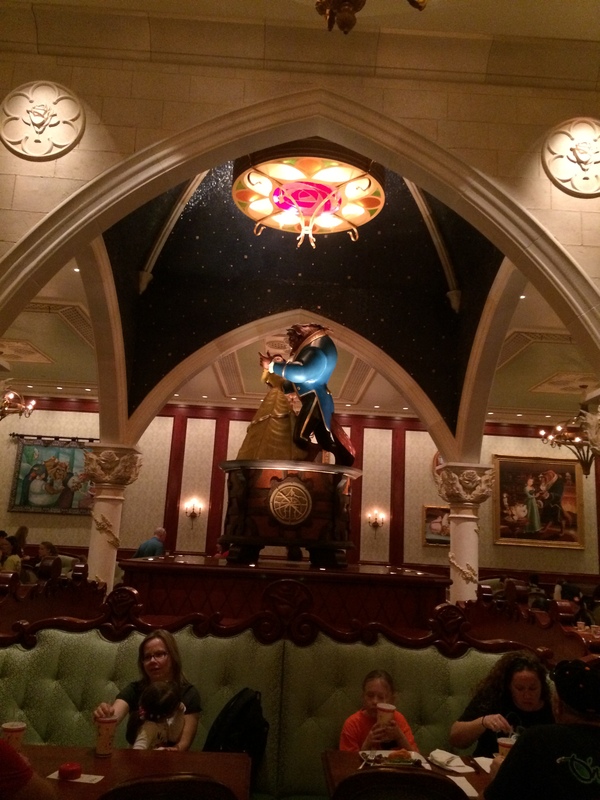 The inside of the Be Our Guest is simply amazing! 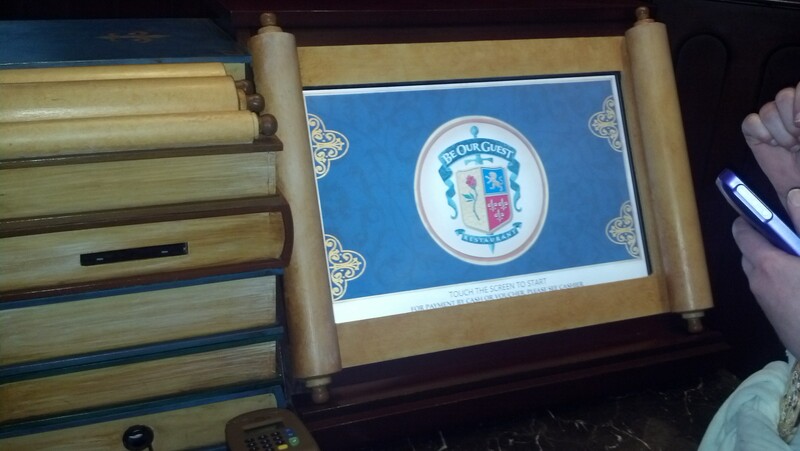 The line will take you into a room where you place your order on these touch screens. They give you a “rose” to take to your table. That’s how the wait staff will know where you are. The first room you can choose to eat in is the grand ballroom. 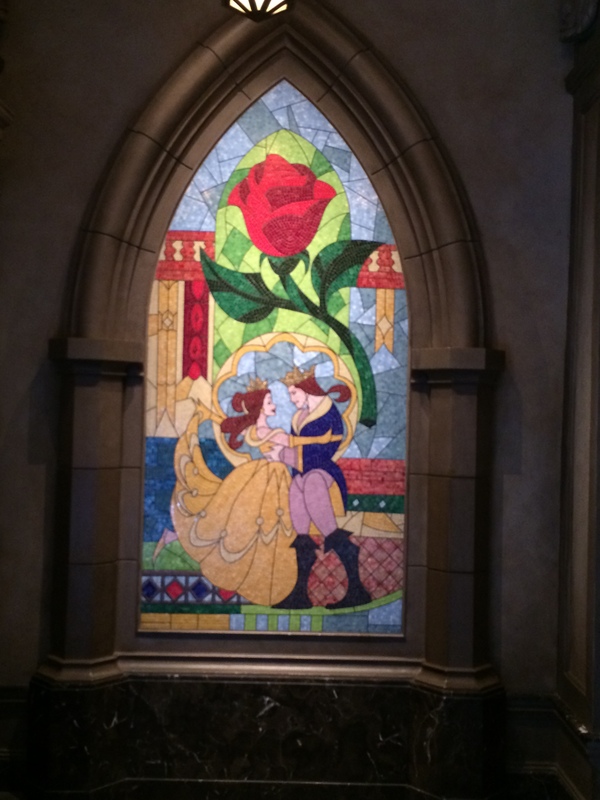 This is a recreation of where the Beast and Belle danced together for the first time. Look! 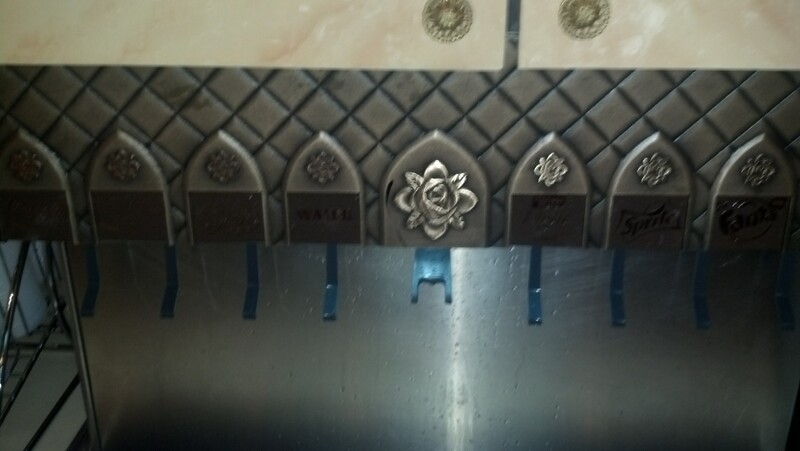 The soda dispensers even have a rose in the middle. To the right of the grand ballroom is this room. I’m not sure what they call it. However, this is where Brooke and I chose to eat. 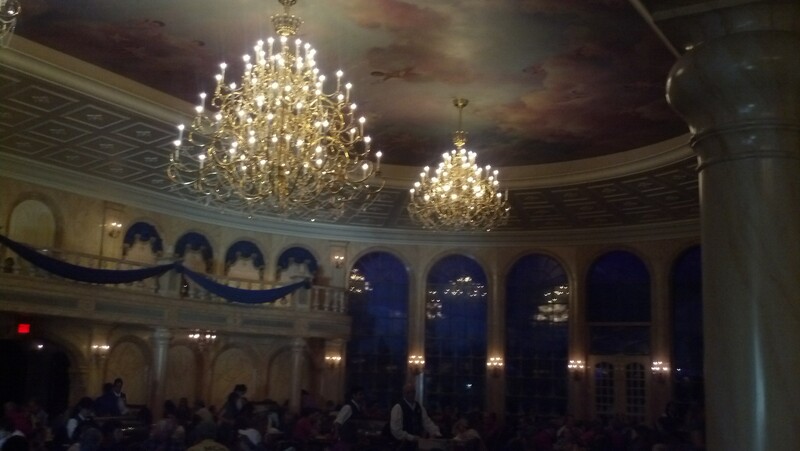 Even though the grand ballroom was full and we couldn’t eat there, we were glad to have eaten in this room. Not a bad view from our table. Don’t you think? 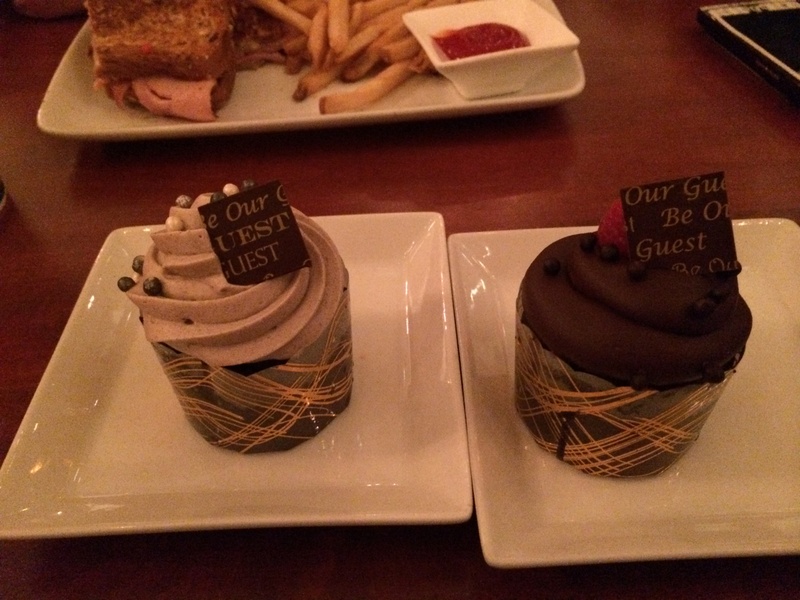 For desert, we each chose a different cupcake and split them. That way we each got half of both. We did try the grey stuff and it was delicious. As good as desert was, I wasn’t a big fan of the sandwich I had…the Croque Monsieur. Brooke liked the sandwich. I should have gone with my original instinct and ordered the Carved Prime Chuck Roast Beef sandwich. Oh well. The third room is the West Wing. This room was much darker, as you’d imagine and oh so cool. Although we weren’t in this room at the right time, we are told that every so often the rose loses a pedal. On the way out, Brooke had to get this picture. This is the full image Brooke posed by. 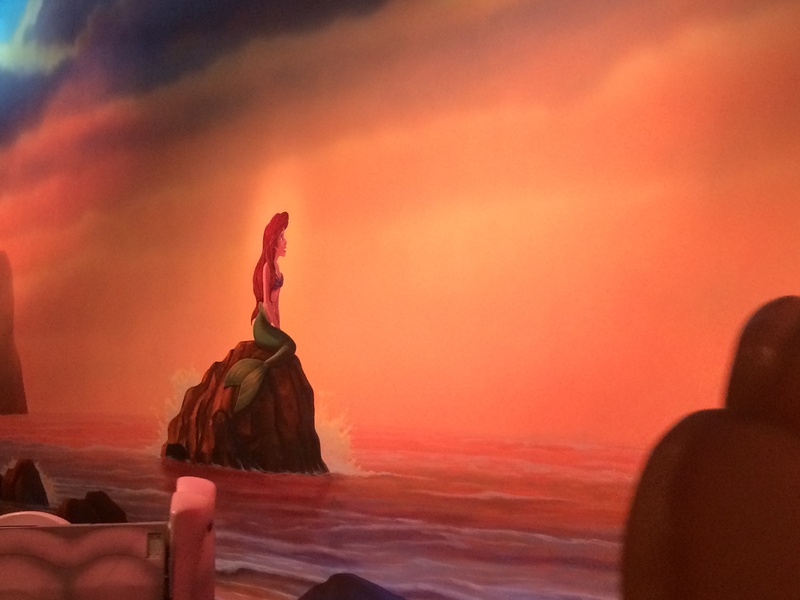 As was the case with the Little Mermaid ride, the details of this restaurant are stunning. I’ll have more pictures up on my flickr account sometime next week. Next, we made our way back down Main Street U.S.A. to catch a meet and greet with Mickey as our last fast pass. 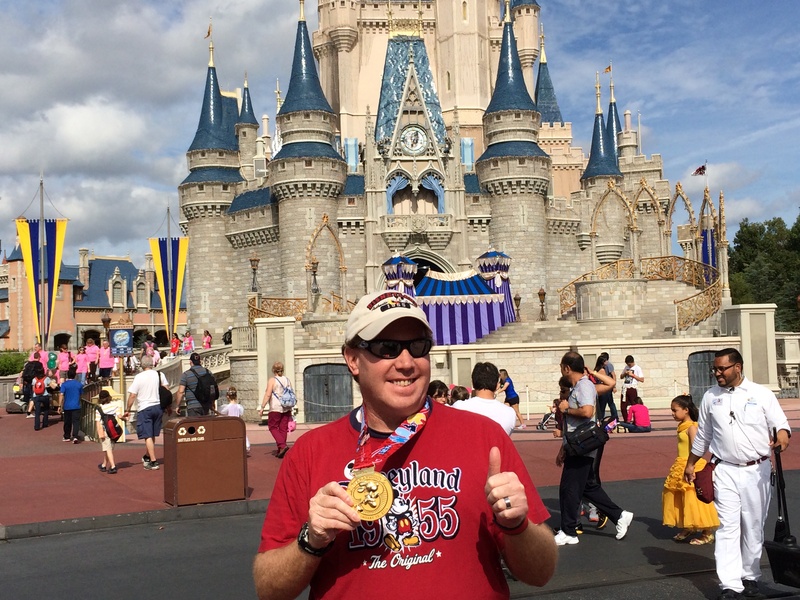 On the way, we got our pictures with our medals by Cinderella’s Castle. This is one of the places on Main Street U.S.A. that feels familiar to the Disneyland fans like myself, but is different. 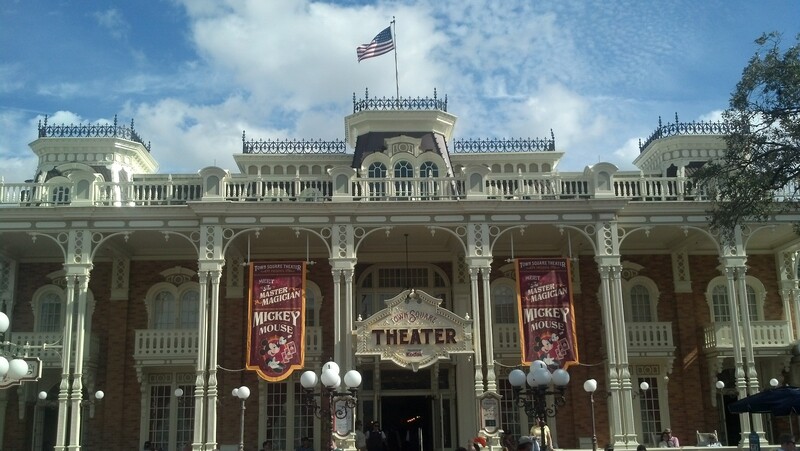 In this place at Disneyland would be the Great Moments with Mr. Lincoln Theater. 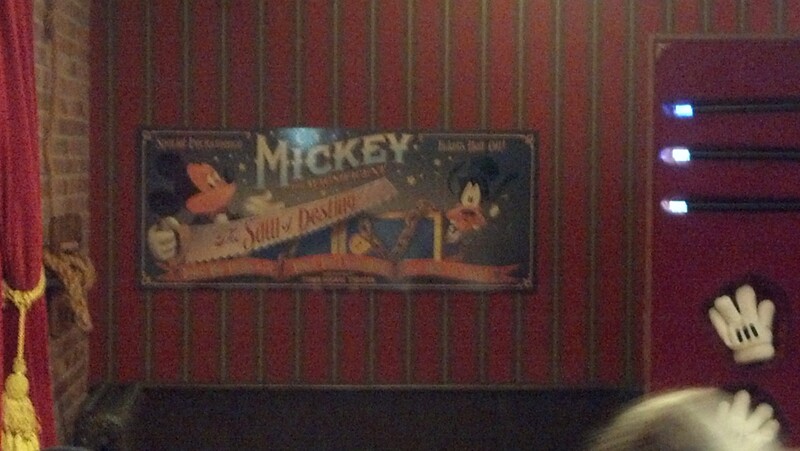 Instead, this is where you meet Mickey Mouse. 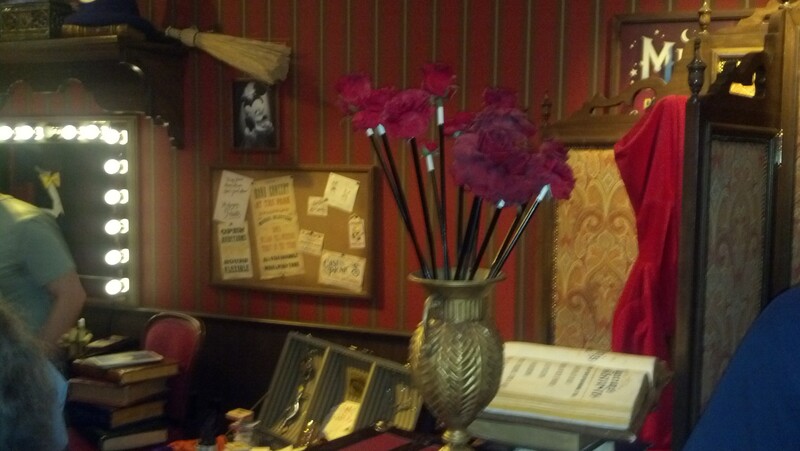 There are lots of fun props on the way. 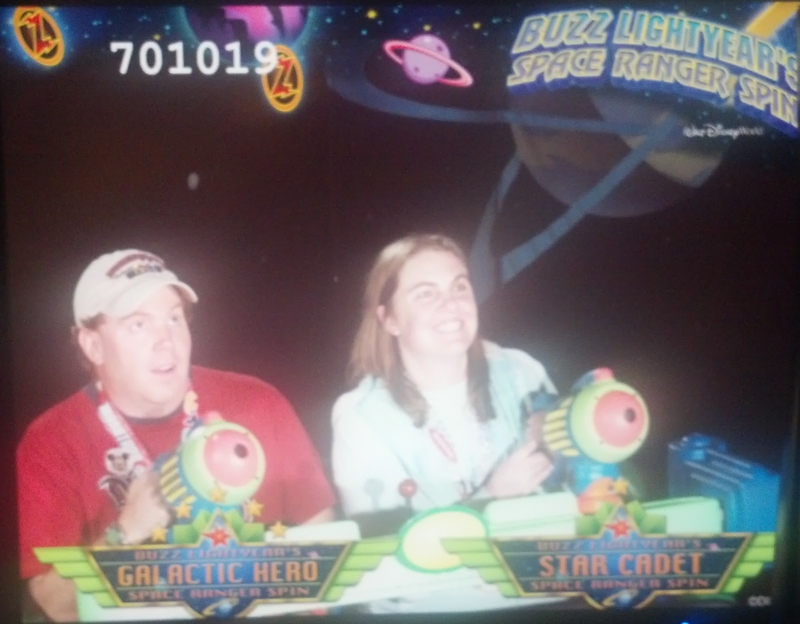 So, I got my picture with Buzz Lightyear on the marathon course because I ran as Buzz. 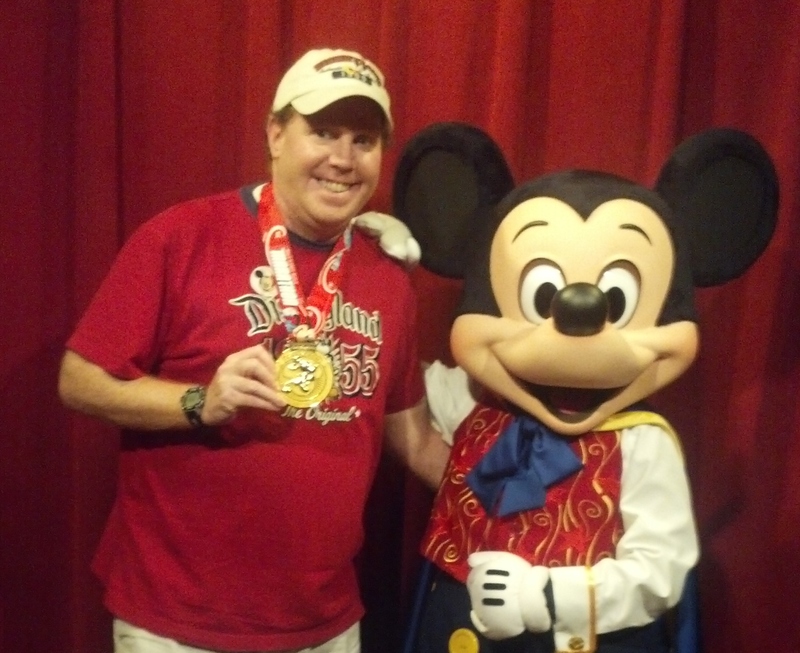 Well, I had to get a picture with Mickey and my Mickey Marathon medal. 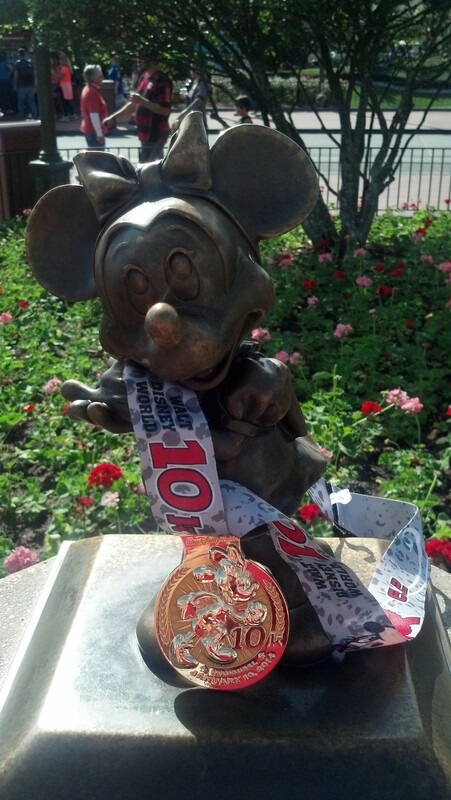 Mickey was really happy to hear that I finished and loved running his race! 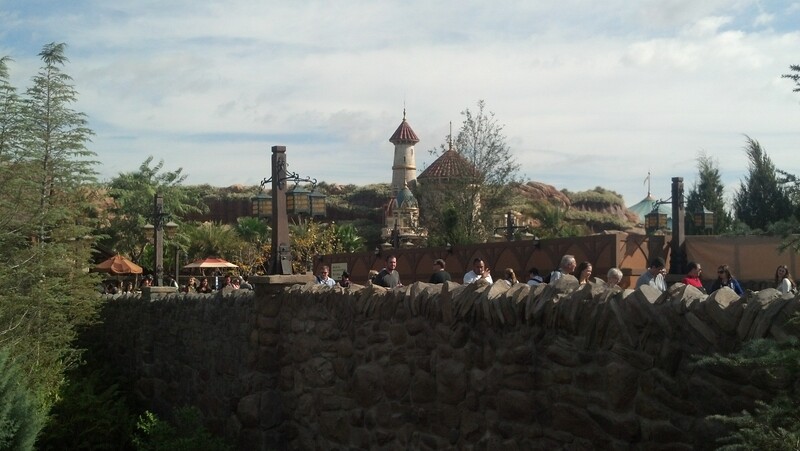 There was still some more of the new Fantasyland to explore. So, we made our way up Main Street again. 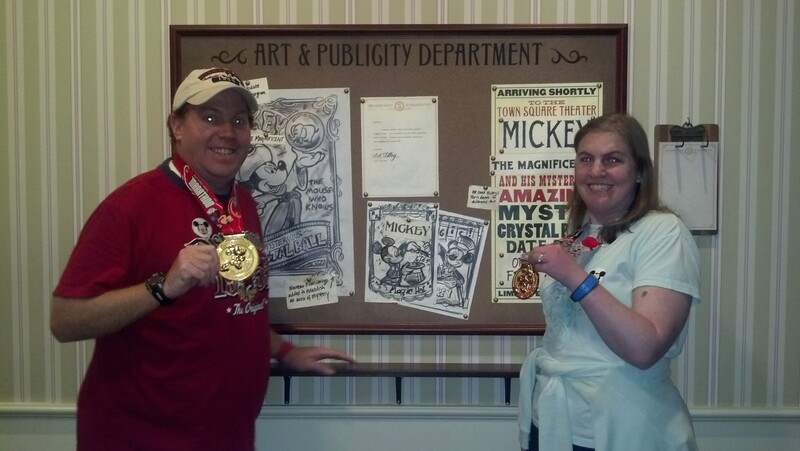 However, we stopped in the hub for some more medal picture-taking fun. 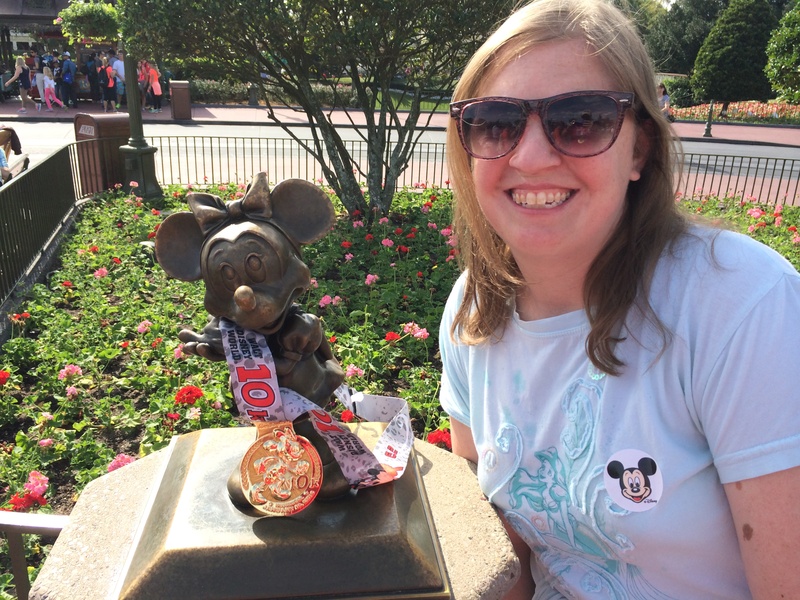 As Brooke would say all week-long, the Walt Disney World 10K was her marathon. She was a proud finisher! I finished the 10K as well. 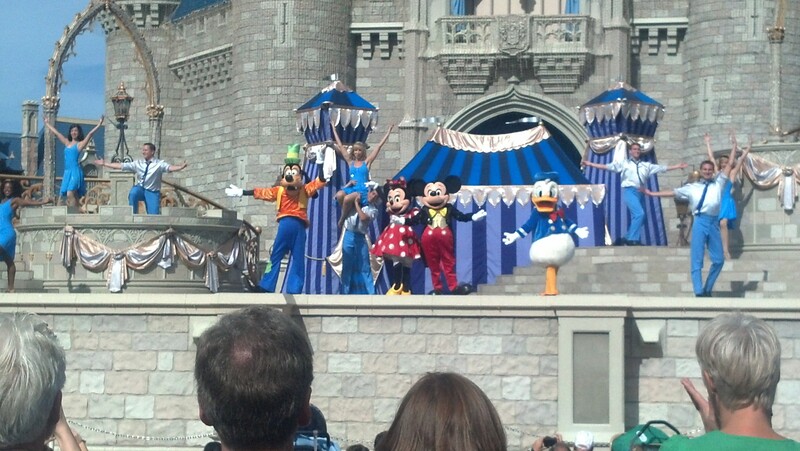 While we were taking our pictures, the Dream Along with Mickey show started. So, we checked it out. If you’ve never seen this little show, you should. It’s really fun! 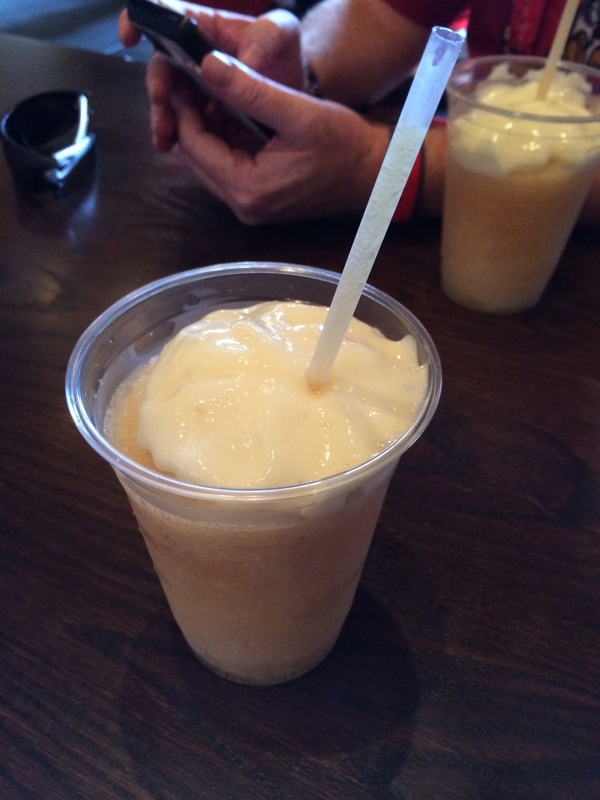 After trying out Butterbeer in the Wizarding World of Harry Potter, I knew that I had to try out Disney’s answer to that amazing drink. 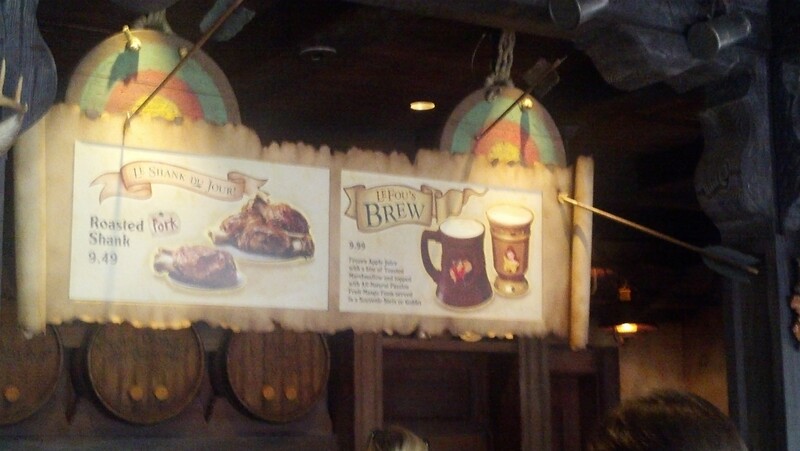 I will say that Lefou’s Brew is a tasty drink. However, it is nowhere near as life changing as Butterbeer. 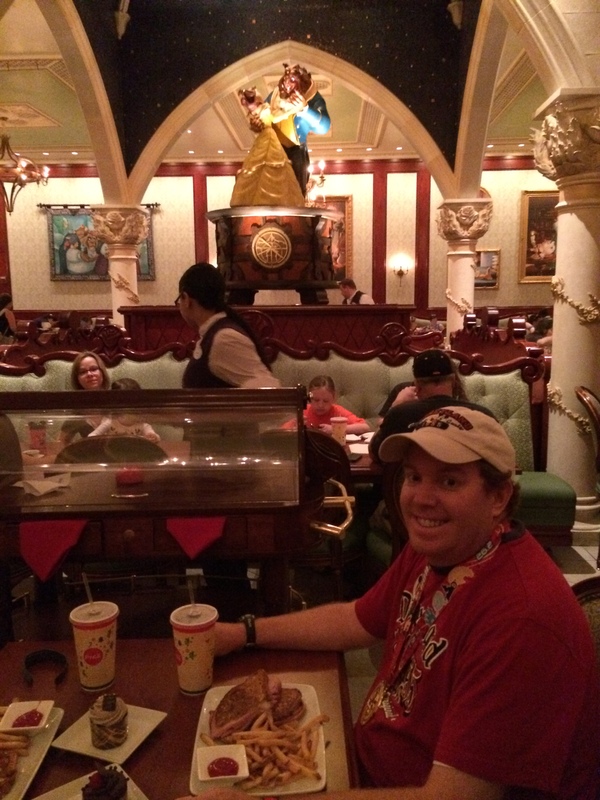 Lefou’s Brew is basically a frozen apple juice with some extra flavorings thrown in. 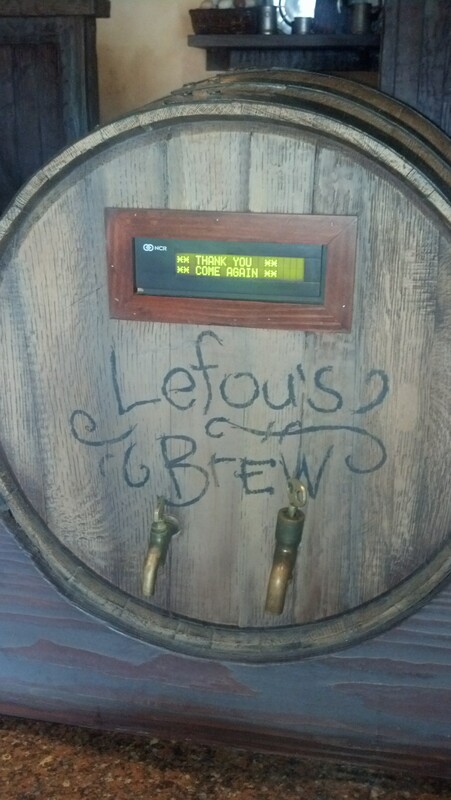 If you’ve had Butterbeer, it is worth it to taste Lefou’s Brew just so you can taste both. 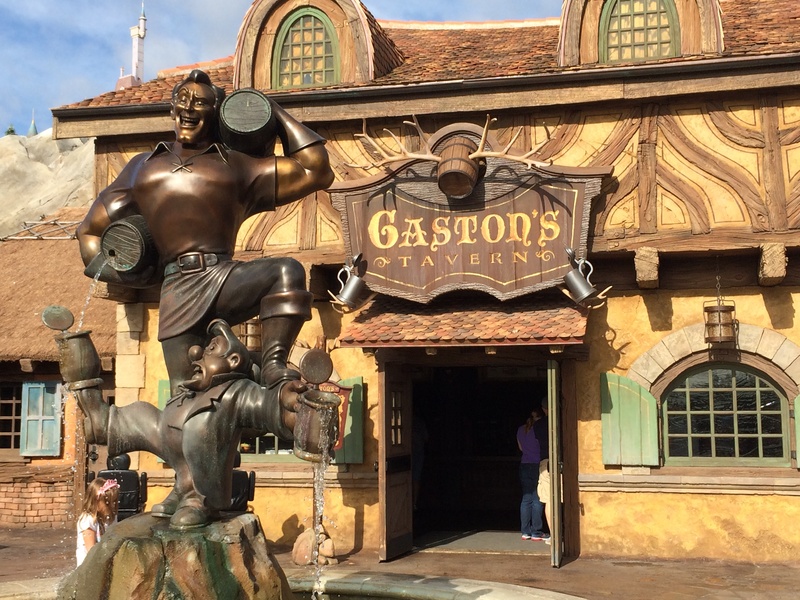 The details in Gaston’s Tavern are just as impressive as everything we experienced in the new Fantasyland. 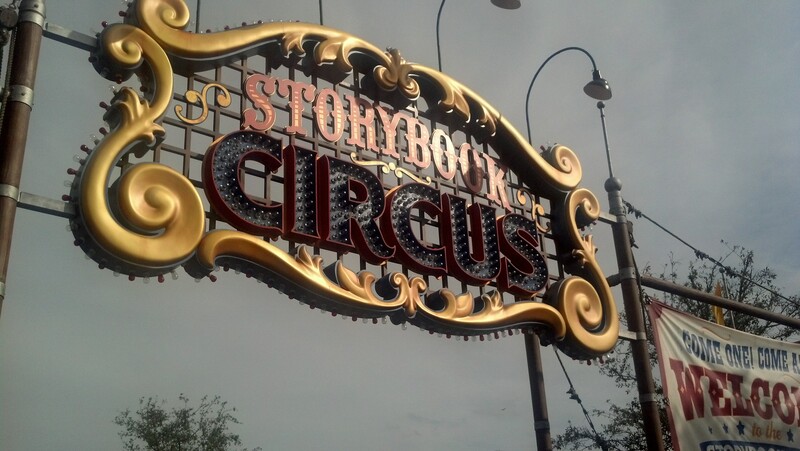 The next stop in the new Fantasyland was the Storybook Circus area. 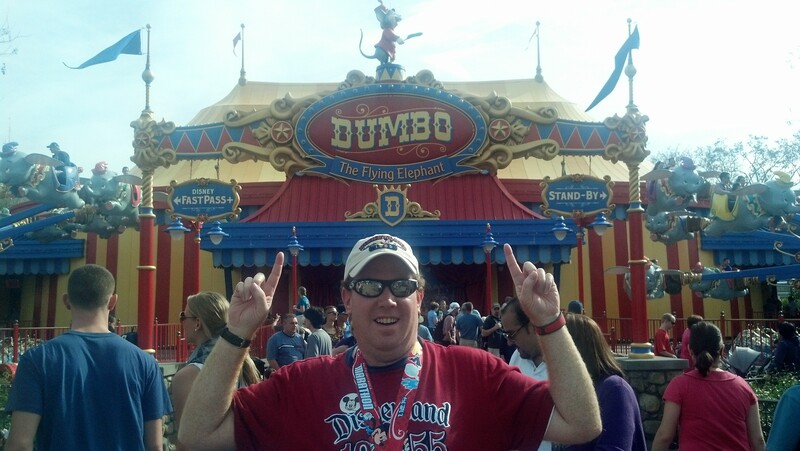 After finishing the Walt Disney World Marathon, I had Dumbo on my mind. 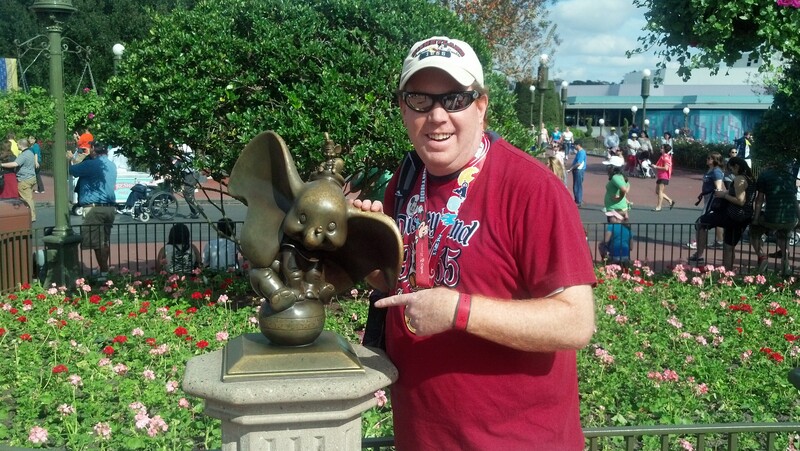 If you’ve been following this blog, you know that I will indeed be running the Dumbo Double Dare Chalenge at the Disneyland Half Marathon Weekend this year! 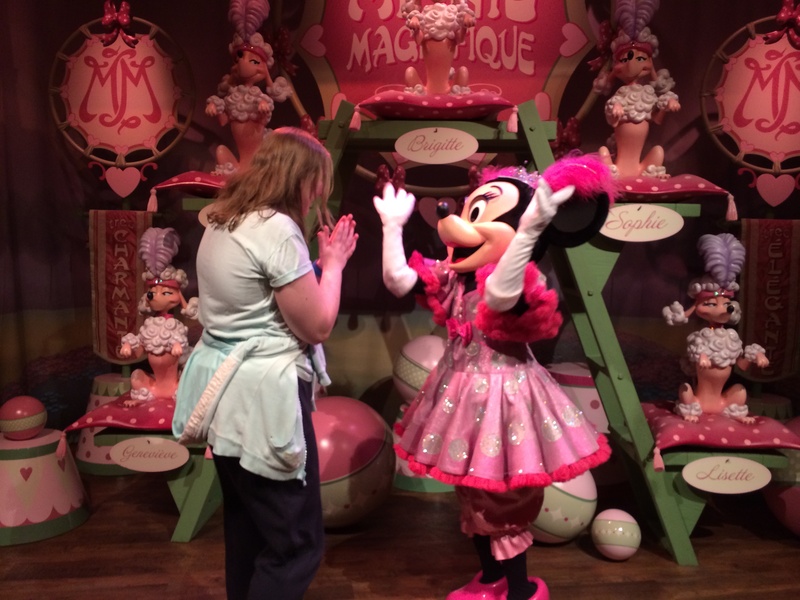 Since we’d already met Mickey, it was time to go see Minnie. 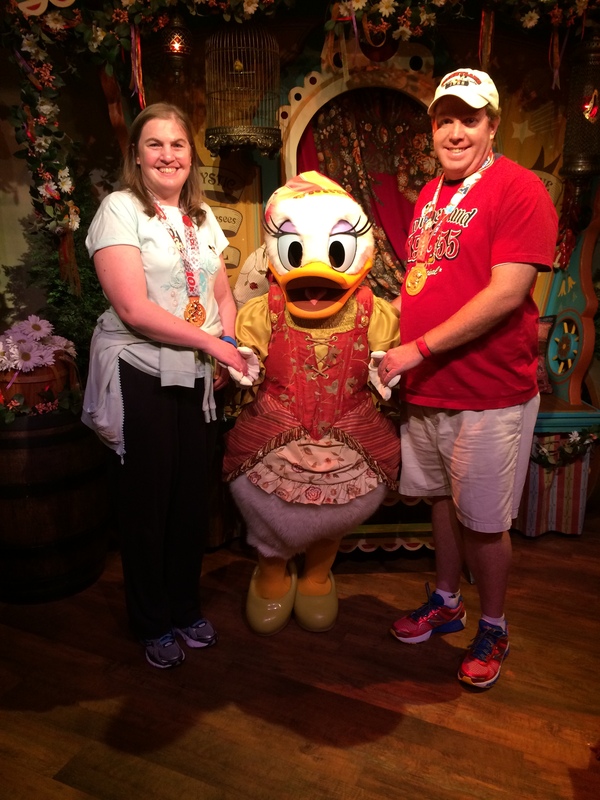 Up first, however was meeting Daisy Duck. The line to meet Daisy and Minnie Mouse was insanely long. Minnie was so happy to hear how much Brooke liked running her race! 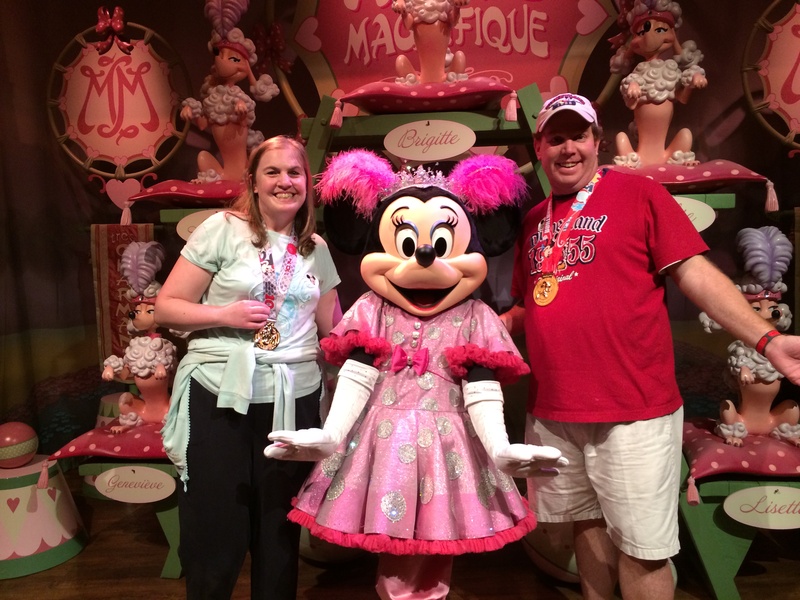 Minnie was proud of me for finishing Mickey’s race as well! 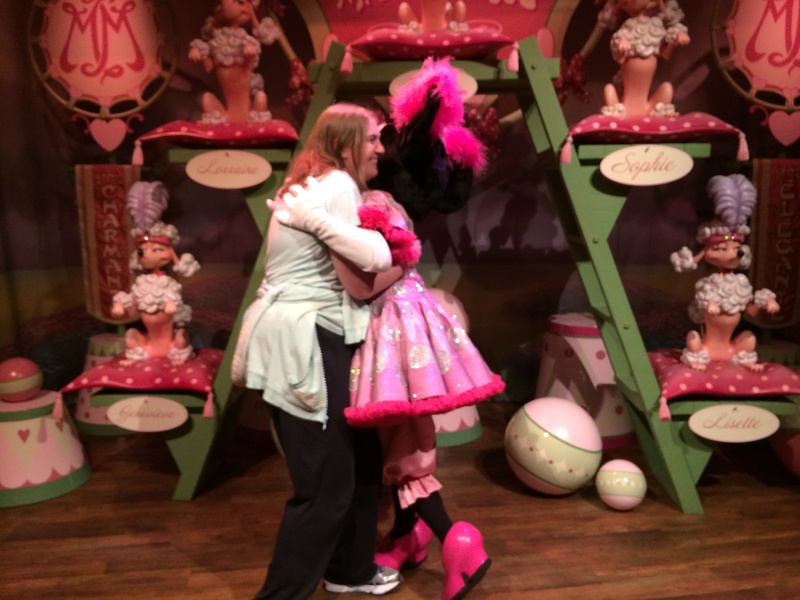 Both of us with Minnie…all happy campers! 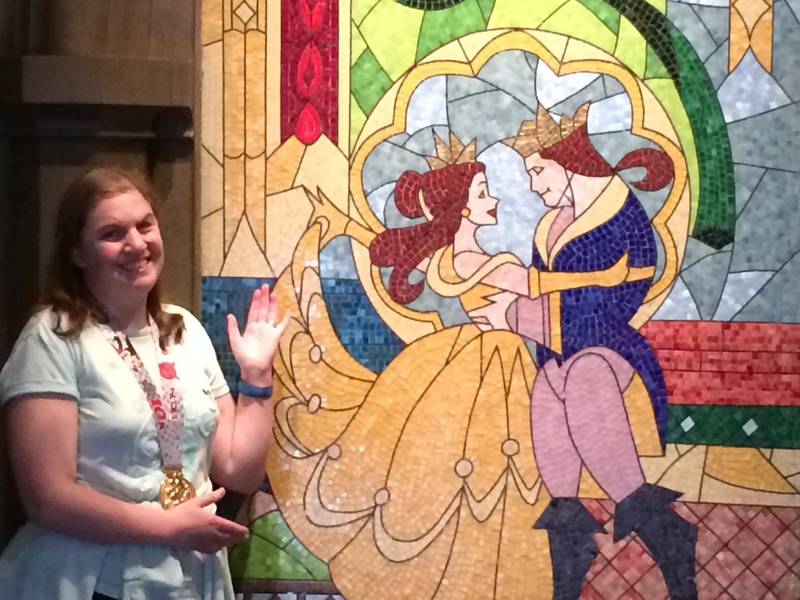 From there, we went to Enchanted Tales with Belle. It was another long wait. Welcome to Disney World. Once you get inside, there is a lot to see. 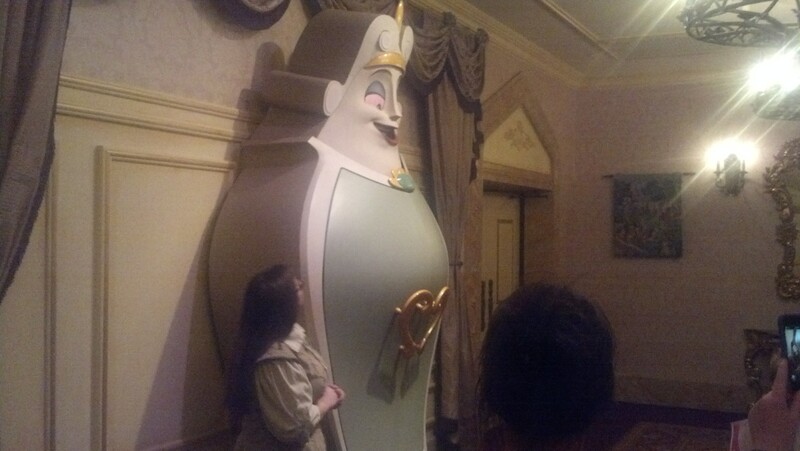 However, the attraction is an interactive show where Lumiere tells the story of the day that Belle and the Beast met for the first time. The first room where the show starts is this one. Inside the chest are props for volunteers to use as part of telling the story. They look for people to volunteer to act out parts of the story. The two adults used in telling the story are two guards. 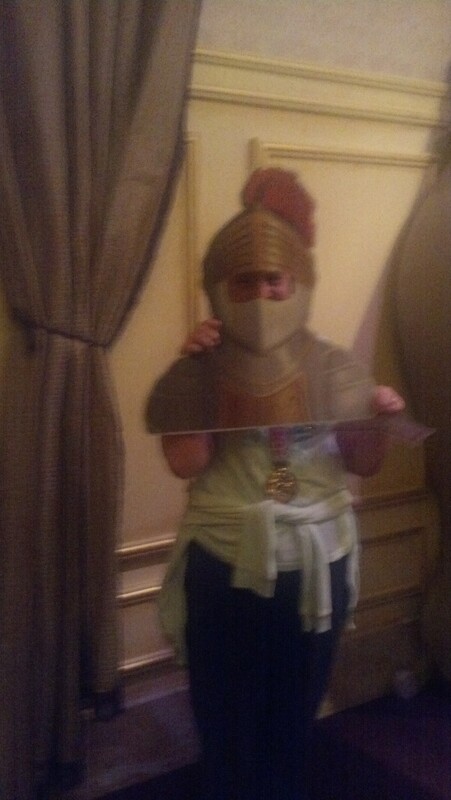 Brooke got to be one of the guards! Once they have all the volunteers ready to go, everyone moves into another room, In this room, there are seats for those not involved in the telling of the story. Once everyone gets in Lumiere gets us ready for Belle’s arrival. Shhh. It’s a surprise! 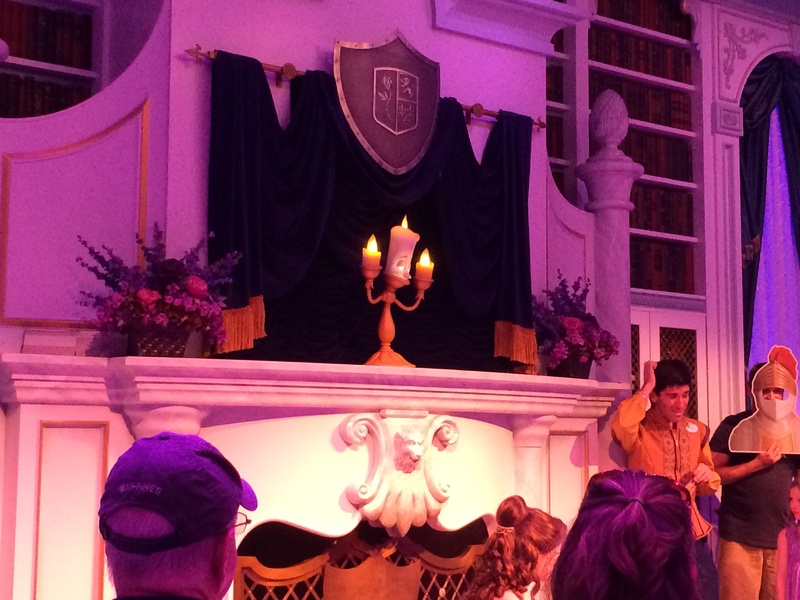 Once Belle arrives, Lumiere tells her why everyone is there…to tell the story of how she and the Beast met. 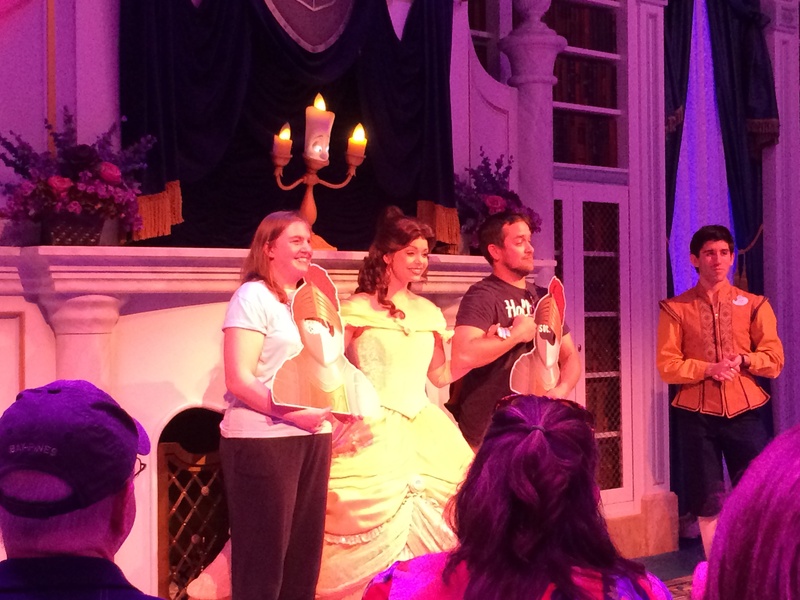 At the end of the story, Belle meets and takes a picture with all of the volunteer cast. 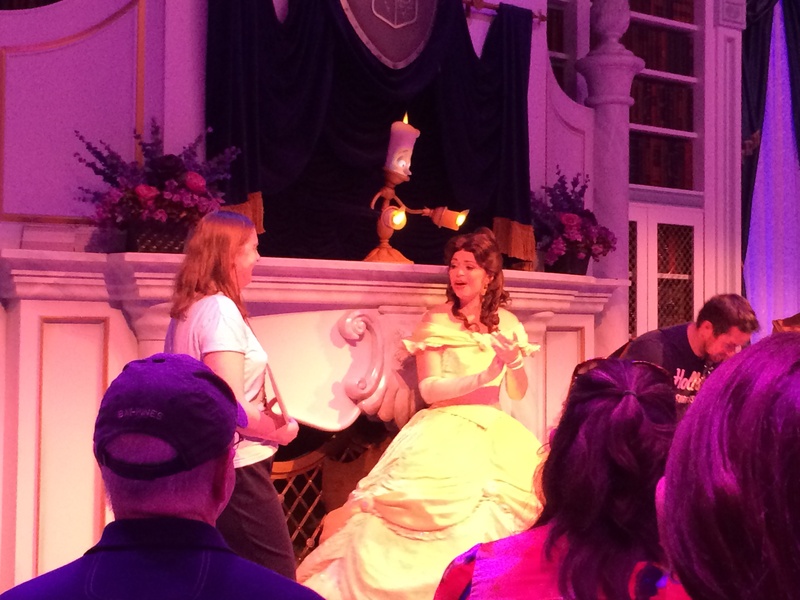 Belle with her two guards! Even though Brooke and I don’t have kids yet, we still had fun. Although, I do think this attraction is best experienced with children, it’s still a fun little show. 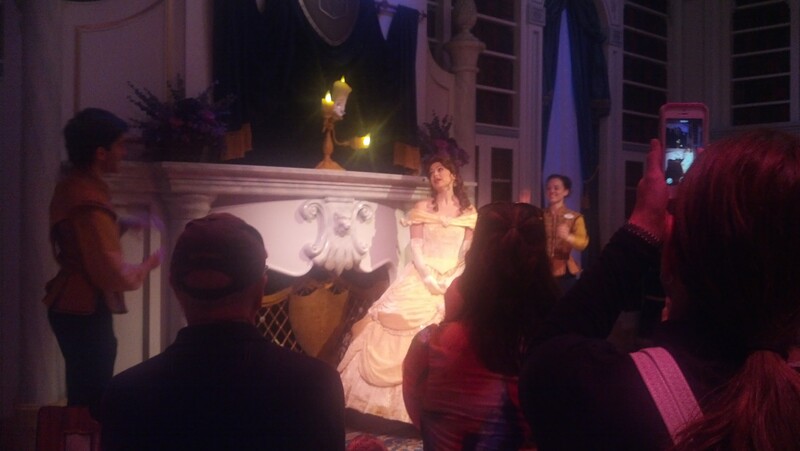 By the time we left Enchanted Tales with Belle, I was all Fantasylaned out. 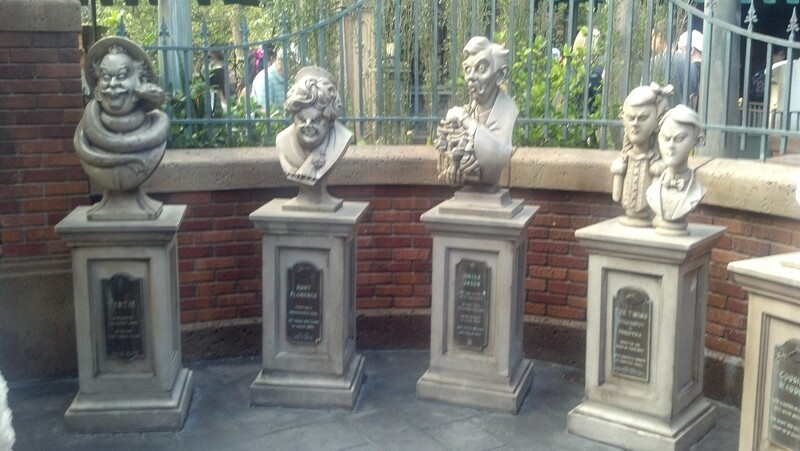 So, we made our way to the Haunted Mansion. 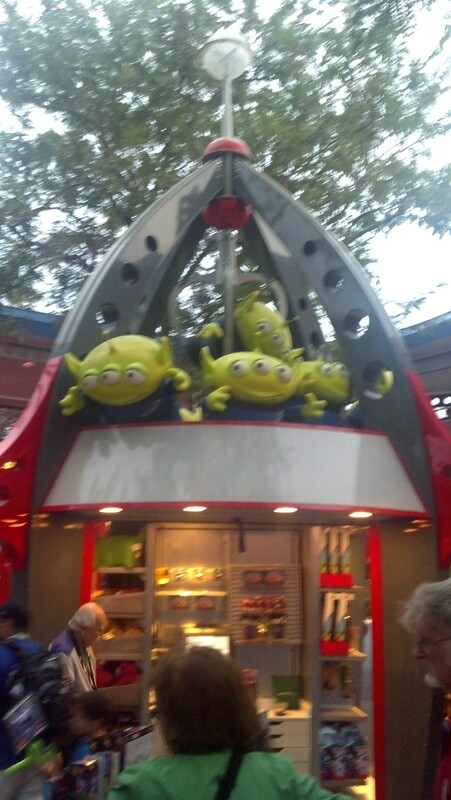 I forgot how cool the queue line was for this attraction. I don’t remember these guys being here in 2009. Nor do I remember this. Anything with trumpets is cool in my book! 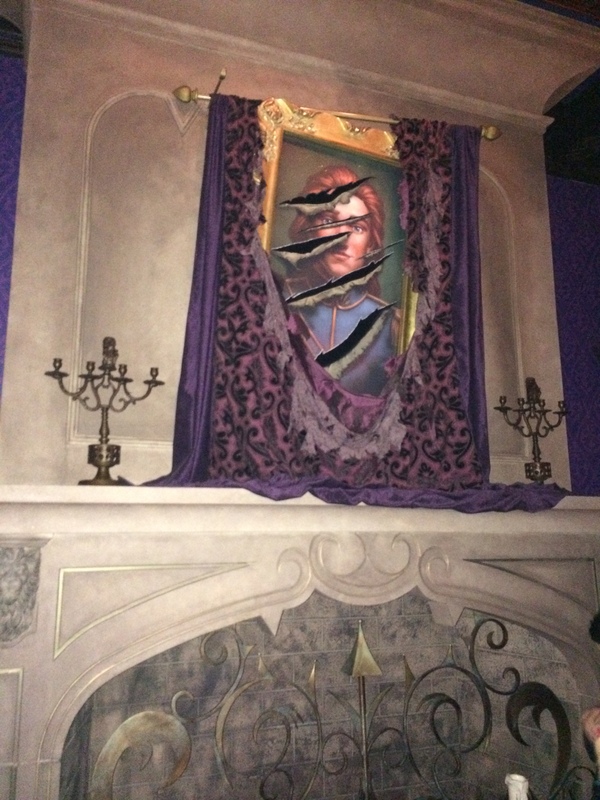 And that Madame Leota is incorporated in the queue line. Her face moves at various times. Really fun! 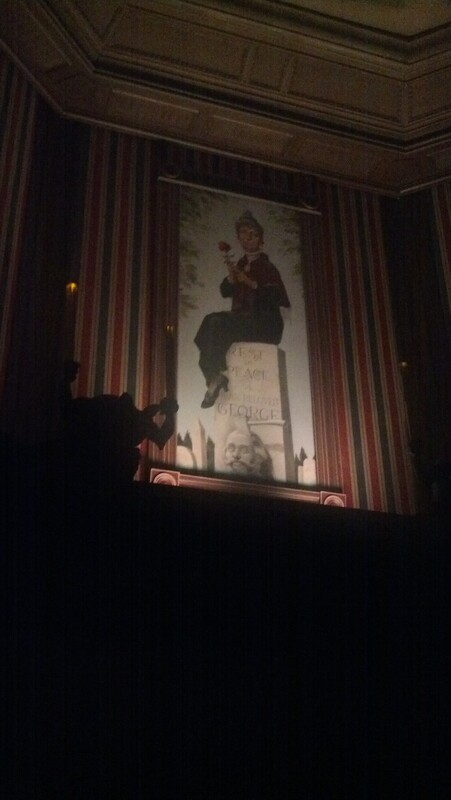 I told Brooke to pay attention because this room at the Magic Kingdom version of the Haunted Mansion actually stretches. 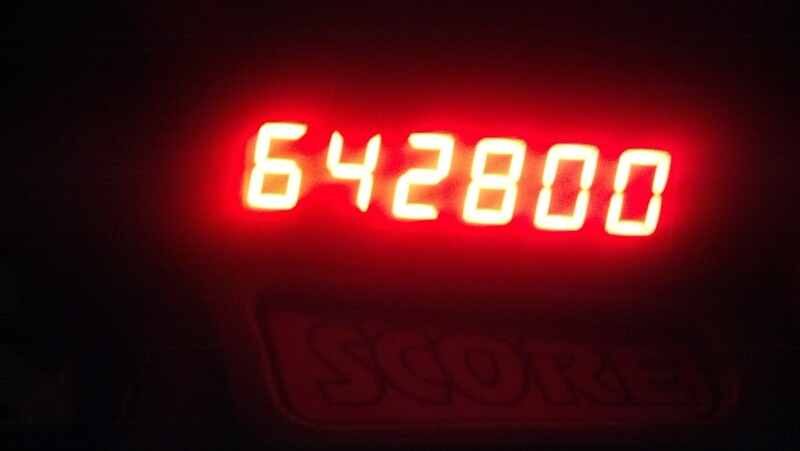 At Disneyland, it’s an elevator that takes you down. 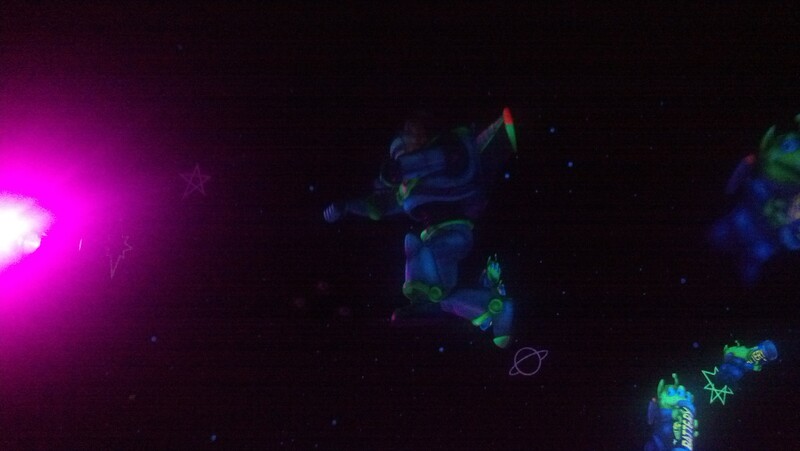 At Disneyland, when the room finishes “stretching” you can feel like you’ve hit the ground floor. At the Magic Kingdom, not at all. 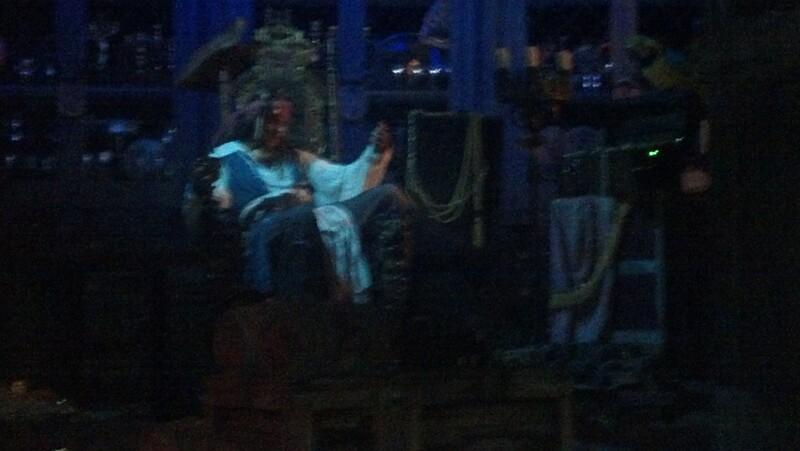 After the Haunted Mansion, we made our way to Pirates of the Caribbean. 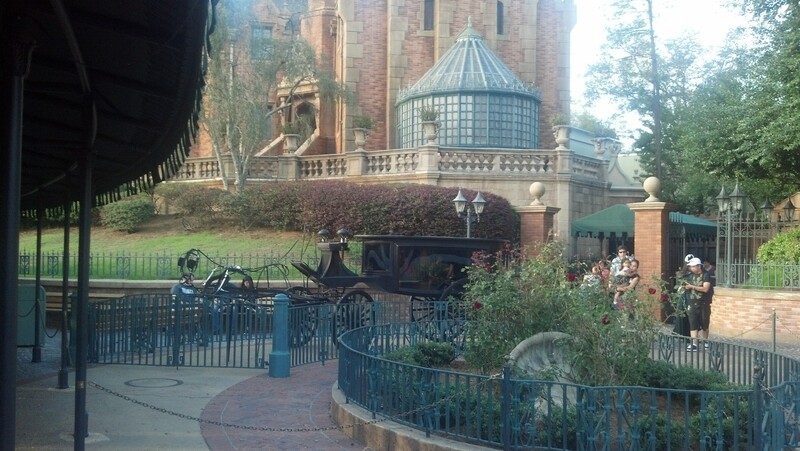 I may prefer the ride at Disneyland to this one. 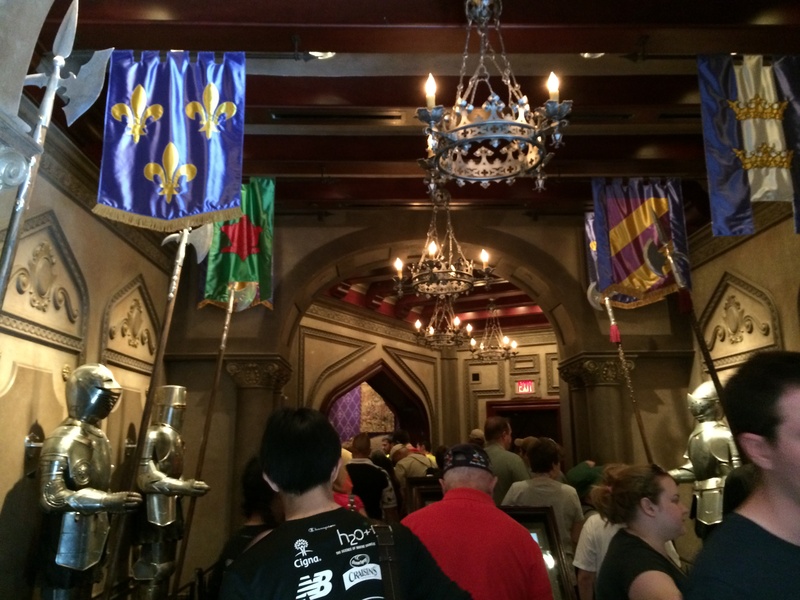 However, the queue line is really cool at the Magic Kingdom. 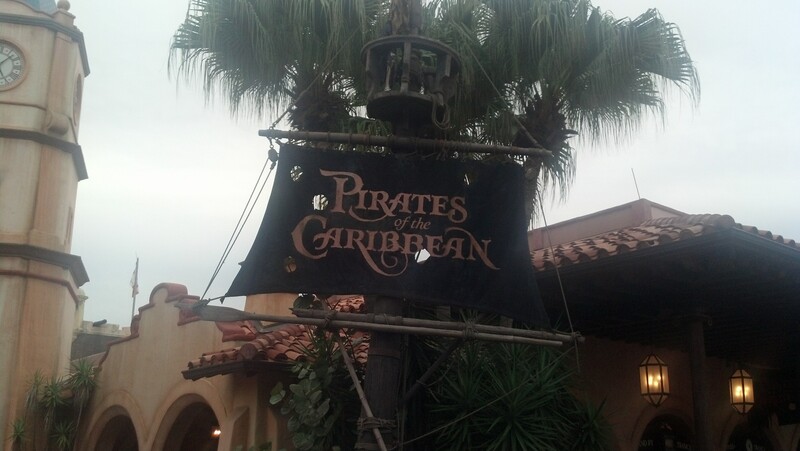 Plus, I just can’t miss riding Pirates of the Caribbean when I’m at a Disney theme park where it’s at. I have to mention this. 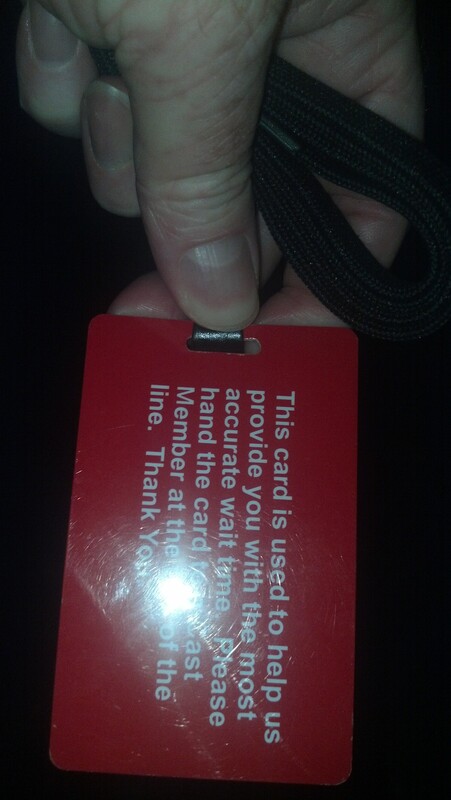 When we got in line at Pirates of the Caribbean, we were handed this red card to give to the person who was in charge of loading the boats. It was the third time I had been given a card like this at an attraction on this day. Brooke and I thought it was funny how many times we were the people given the red card. 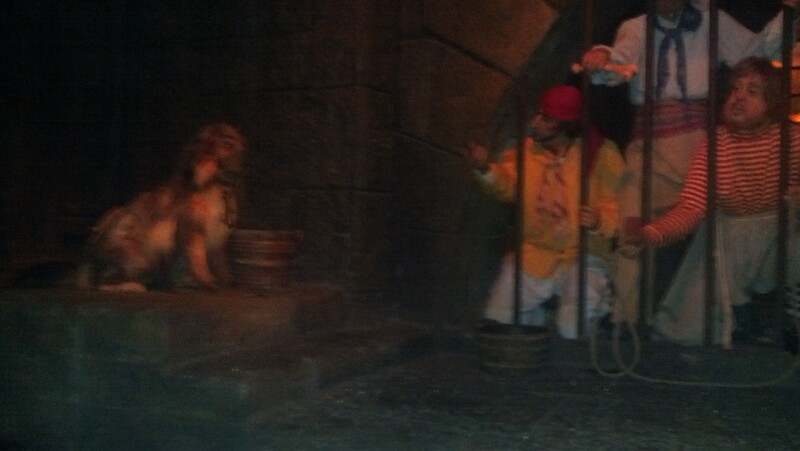 My favorite scene in Pirates of the Caribbean! So, after Pirates of the Caribbean, time started becoming an issue. 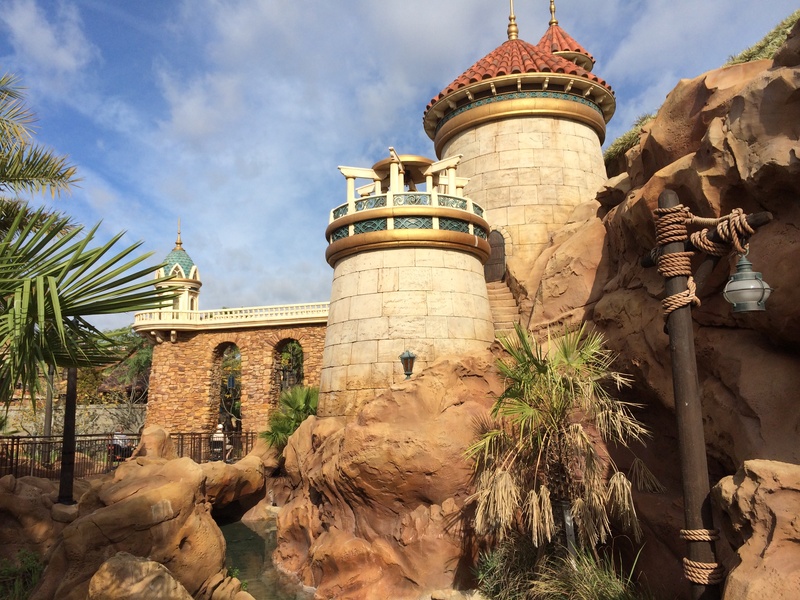 I wanted to wander around Adventureland to see what I didn’t get to see on our honeymoon. 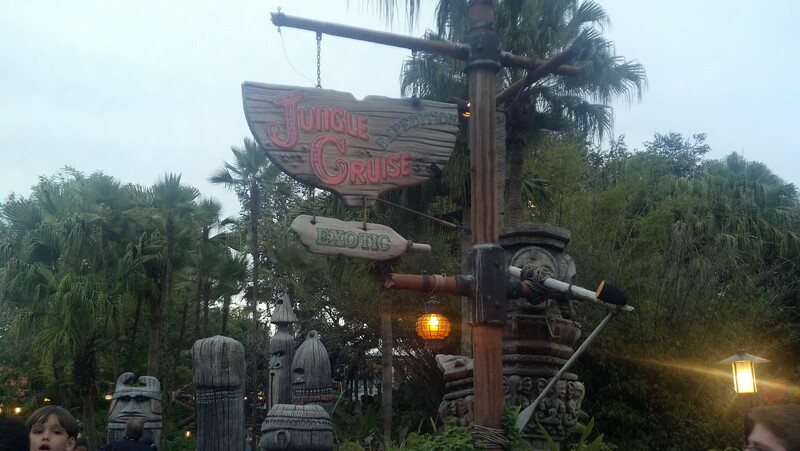 Initially, I wanted to ride the Jungle Cruise here. However, the wait was just too long. 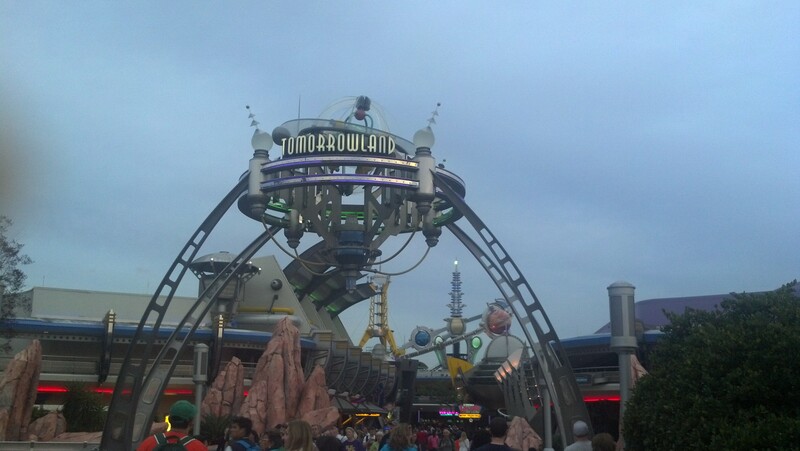 So, we headed back to Tomorrowland. 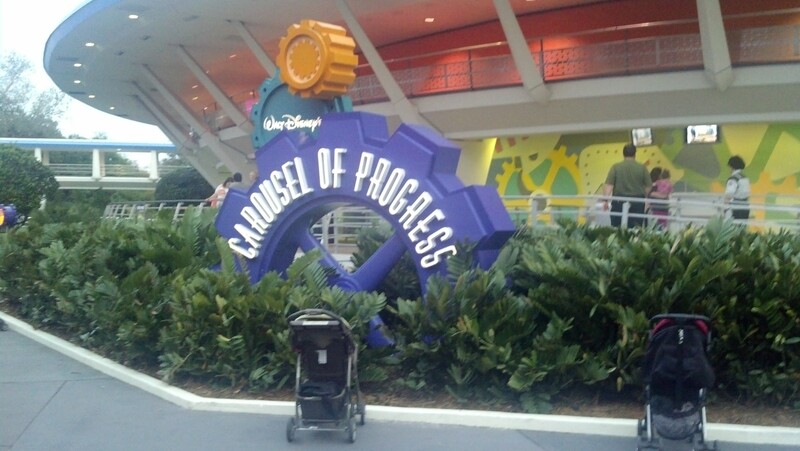 Since my honeymoon, I had heard a lot about the Carousel of Progress. 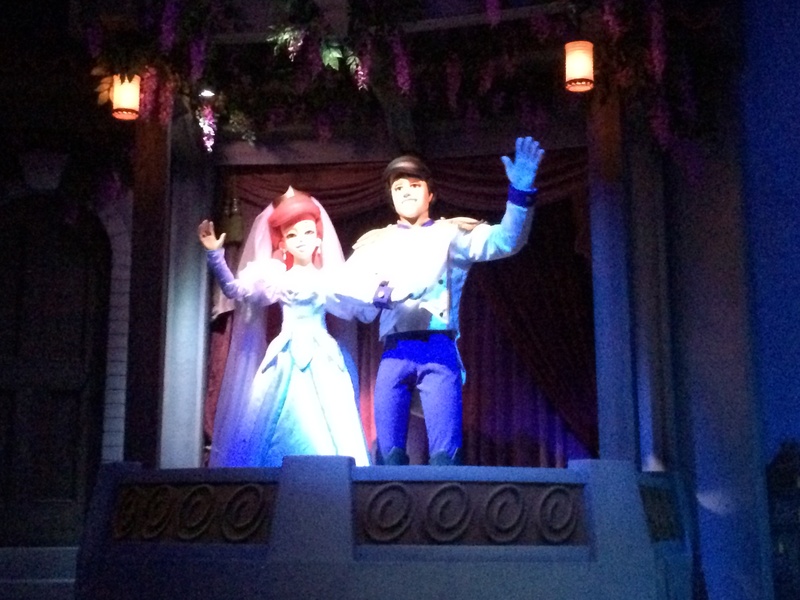 We didn’t do that attraction on the honeymoon and I really wanted to see it. 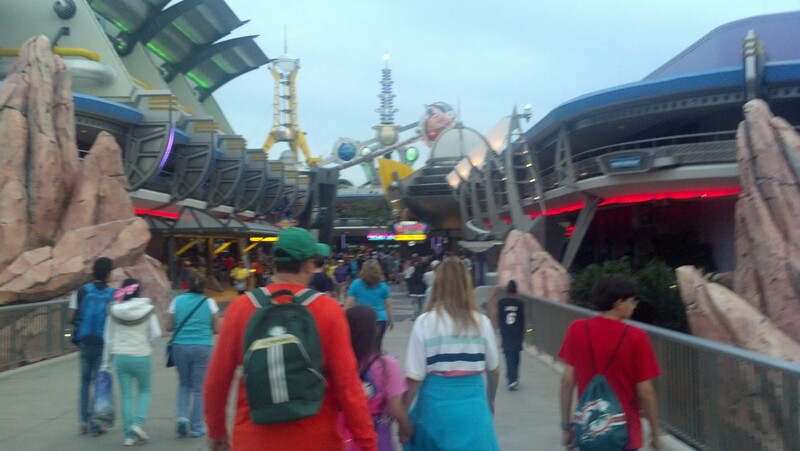 Tomorrowland in the Magic Kingdom is kind of cool looking. Isn’t it? We made it! For all the hype around this show, it was just okay. The cool part for me was realizing that this show pre-dated the America Sings attraction at Disneyland. So, I got to see a piece of Disney theme park history. I’ve been told that this show has gone through updates and I can see that. However, with the exception of the HD flat screen television, the last update seemed to have taken place in the early 1990’s. 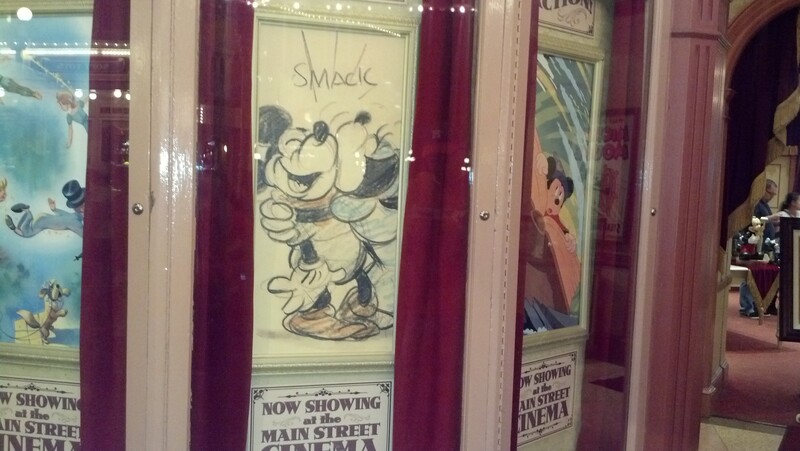 Still, I’m glad I got to experience this attraction that we no longer have at Disneyland. Once we got off the Carousel of Progress, it was decision time. The People Mover aka the Tomorrowland Transit Authority was right across from the Carousel of Progress and I really wanted to ride. The wait was listed as pretty short. However, it was also getting close to the start of the Main Street Electrical Parade which I also wanted to see really bad. So, what to do? On top of that, we hadn’t had dinner yet. This was a point where I really wished I was in Disneyland or knew the Magic Kingdom as well as I knew Disneyland. Things were just not in the right place. 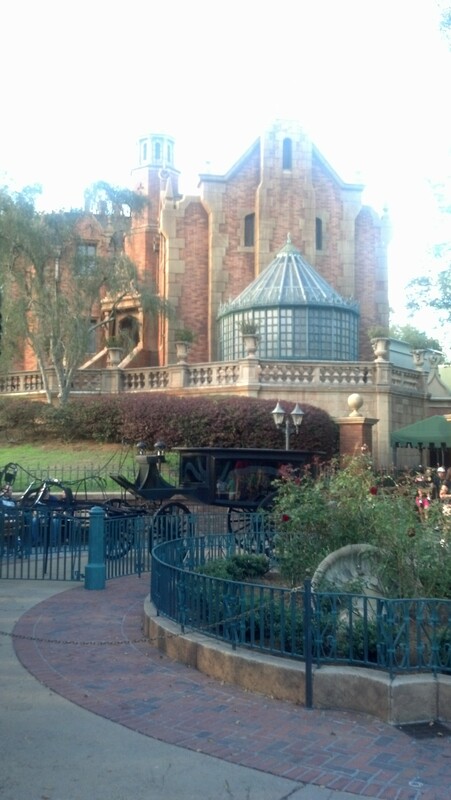 It would have been perfect to hop on by the Pizza Port at Disneyland. However, this place wasn’t there. So, Brooke and I decided to make our way to Main Street to stake out a place to watch the Main Street Electrical Parade. Along the way, we’d try to keep an eye out for where we could grab something. Nothing came our way. So, we settled right here. 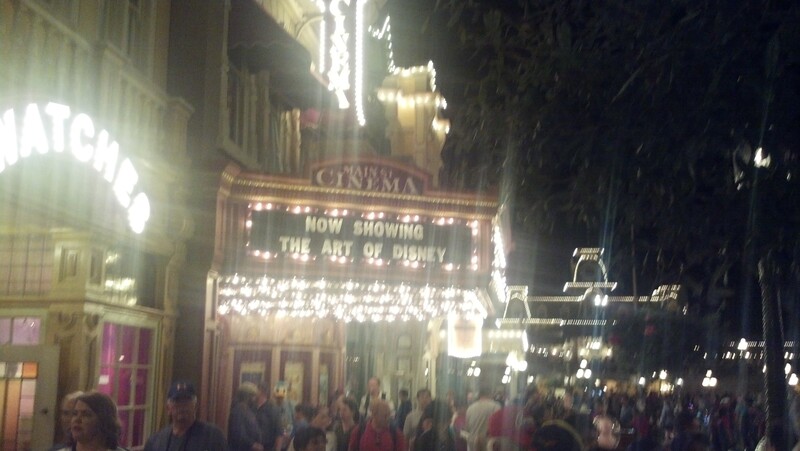 Now, unlike Disneyland, the Main Street Cinema is a retail place where I thought I saw some sort of snack items sold. So, I had Brooke hold our spot and I went looking for food. I liked this sign…but wasn’t interested in the food. Luckily, Brooke had some snacks for us to eat before the parade. 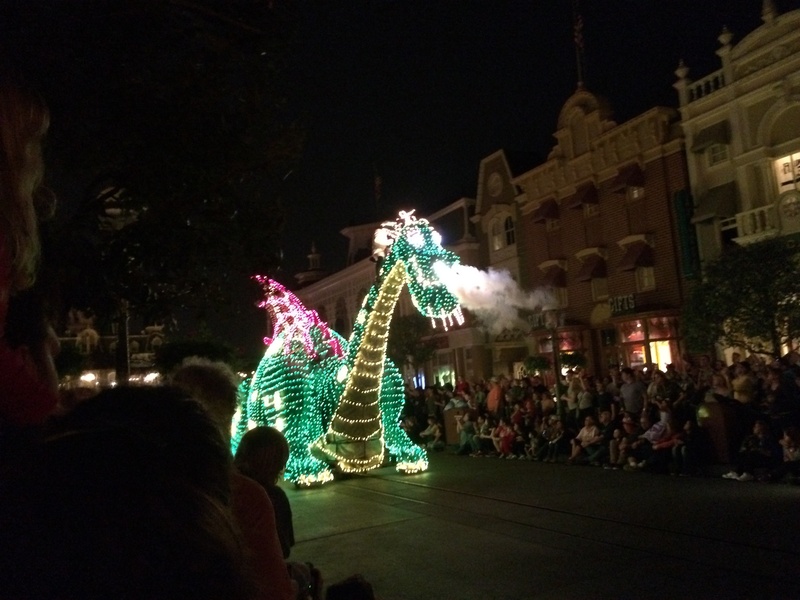 I was so excited to see the Main Street Electrical Parade again! 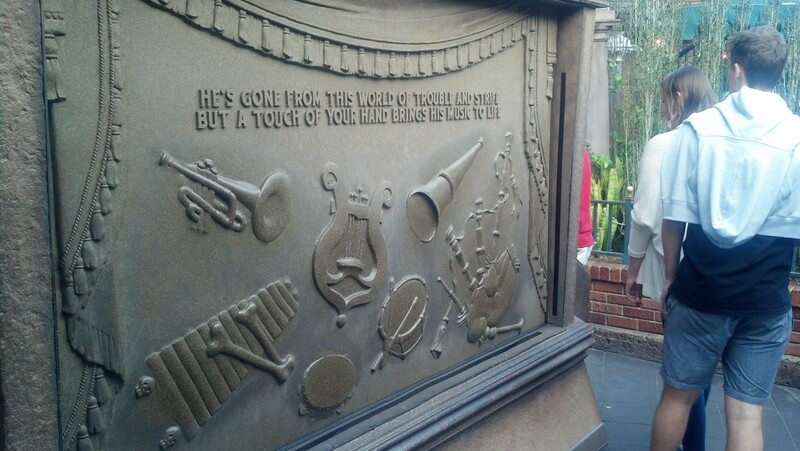 The last time I saw it was in its last summer at Disneyland, when I worked as a cast member. 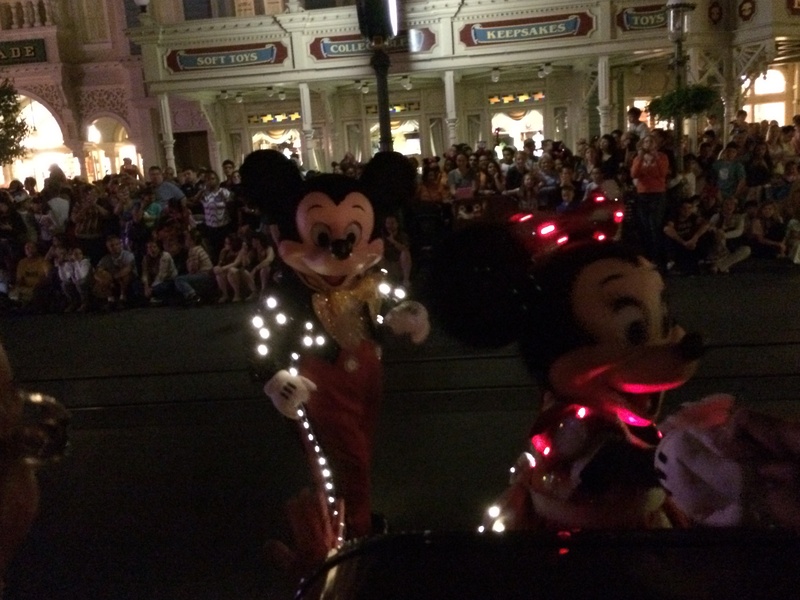 They did bring back the Electrical Parade to Disney’s California Adventure briefly. However, it never worked out to see it when I was in that theme park. 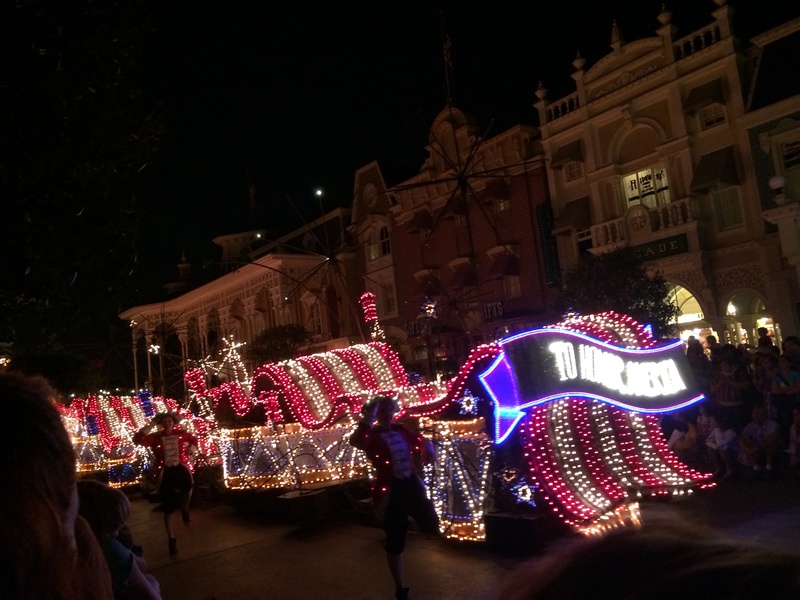 Plus, it just seemed wrong to watch the Main Street Electrical Parade anywhere but on Main Street U.S.A.
For this occasion, Brooke snapped photos and I took the following video. I hope you enjoy. 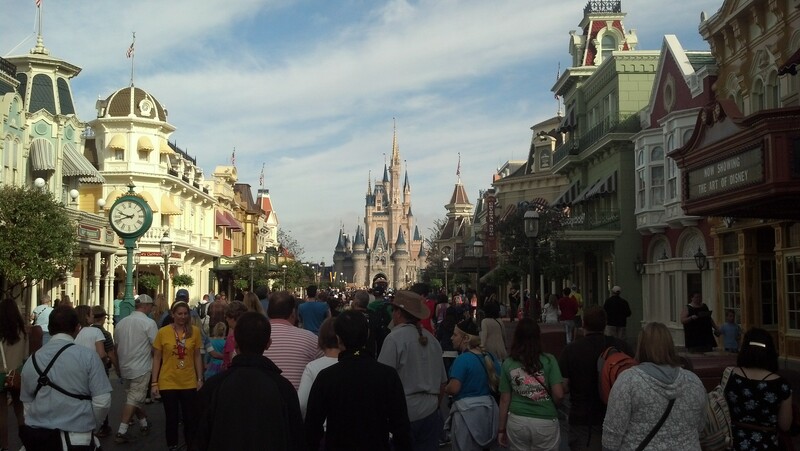 After the parade, we followed the masses up Main Street U.S.A. to stake a spot to view Wishes. 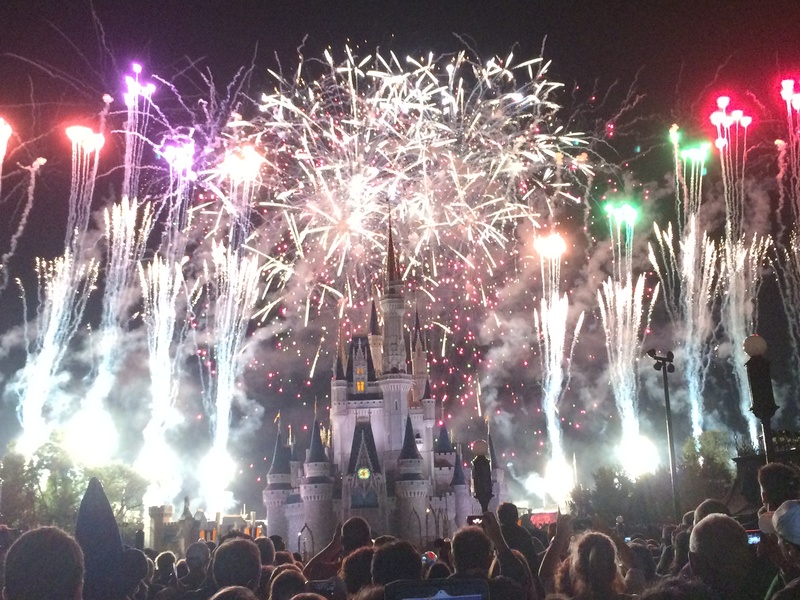 However, before Wishes, there was another show called Celebrate the Magic! Neither Brooke nor myself had a clue what this show would be about. Since it was scheduled right between the Main Street Electrical Parade and Wishes, we just took it in. What a wonderful show! 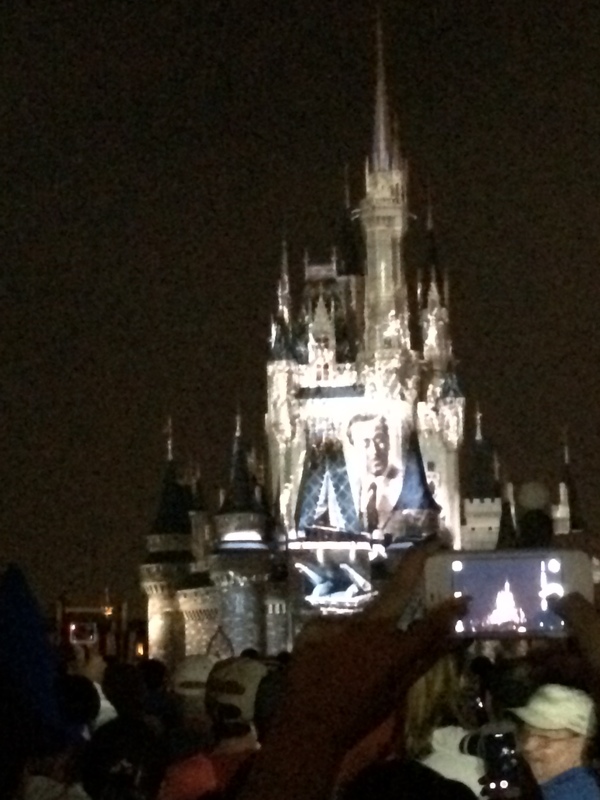 It’s another Disney clip show with Cinderella’s Castle as the canvas, or screen. 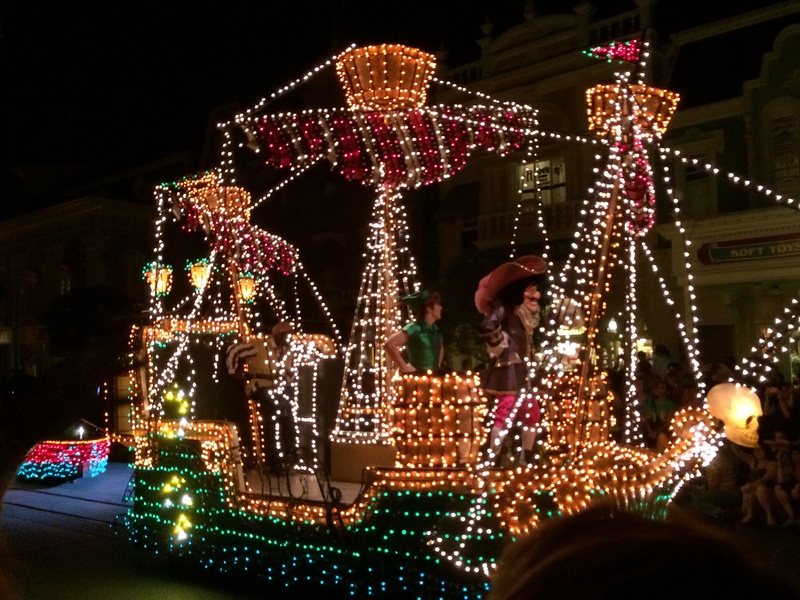 Just like the Main Street Electrical Parade, Brooke snapped pictures and I took the video. I hope you enjoy. After Celebrate the Magic! it was time for Wishes. When we were on our honeymoon, we got to see Wishes from the beach at the Polynesian Resort relaxing on a hammock. That meant we didn’t get to hear the music. We just saw the fireworks. That was cool, but I really wanted to see the fireworks from inside the Magic Kingdom this time. What a great fireworks show! I absolutely LOVED Wishes! 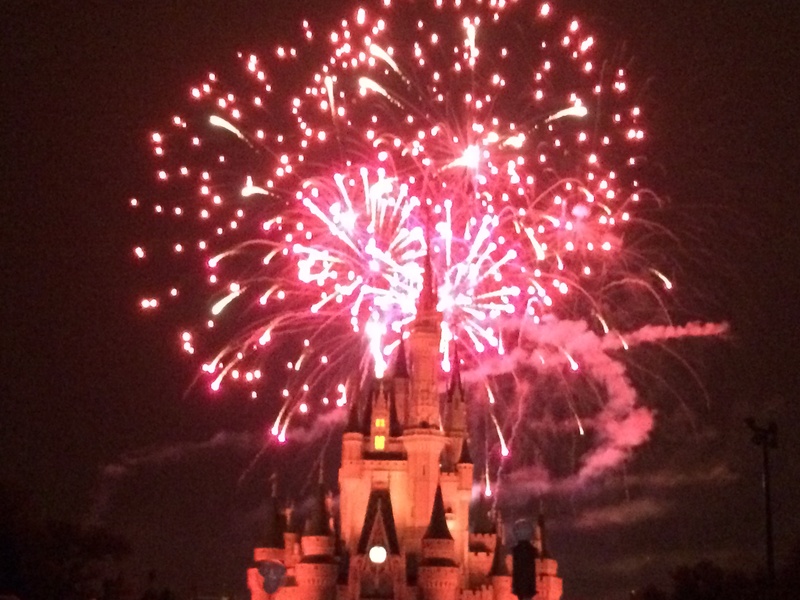 It’s my second favorite Disney theme park fireworks show. That 50th Anniversary of Disneyland Fireworks show called Remember Dreams Come True is slightly better, in my opinion. 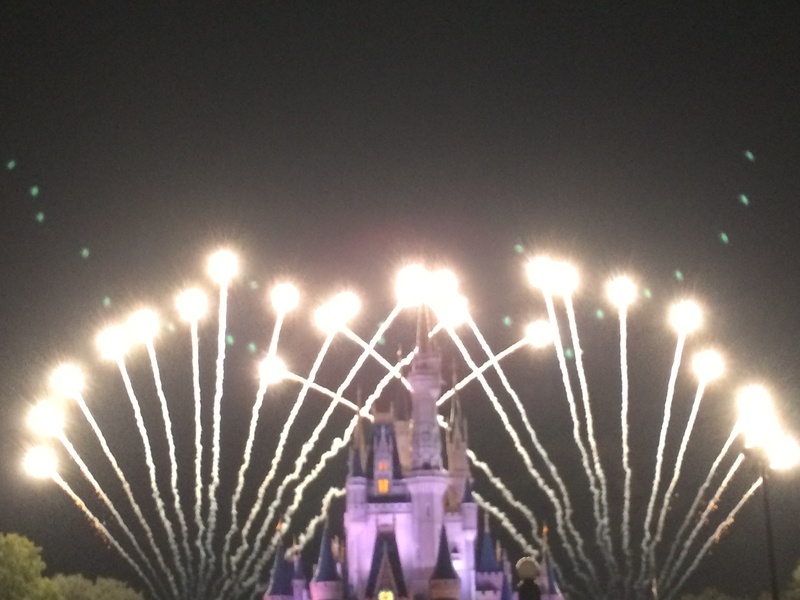 However, I could watch Wishes any day of the week. After Wishes, we could have left the park and that would have been fine. However, I really wanted to do the People Mover and Brooke said we could. So, off we went. The line was short and I was really excited about getting to hit up almost every attraction I wanted to do on this visit to the Magic Kingdom. The People Movers went much faster than I was expecting. 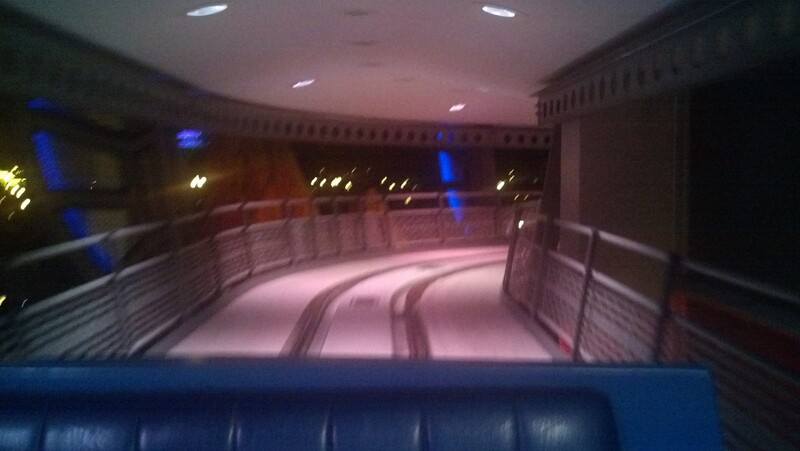 The People Mover at Disneyland moved along at a much slower pace. 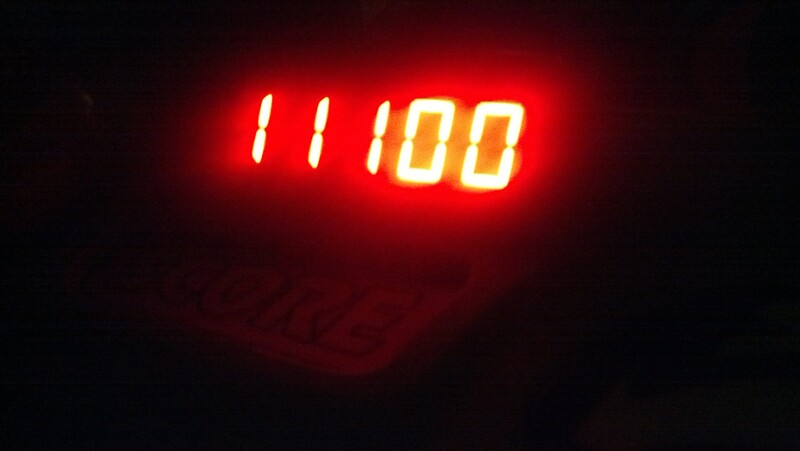 However, it still wasn’t a fast ride, just faster than I had expected. Once I got over the speed being faster than expected, it proved to be a very relaxing ride. 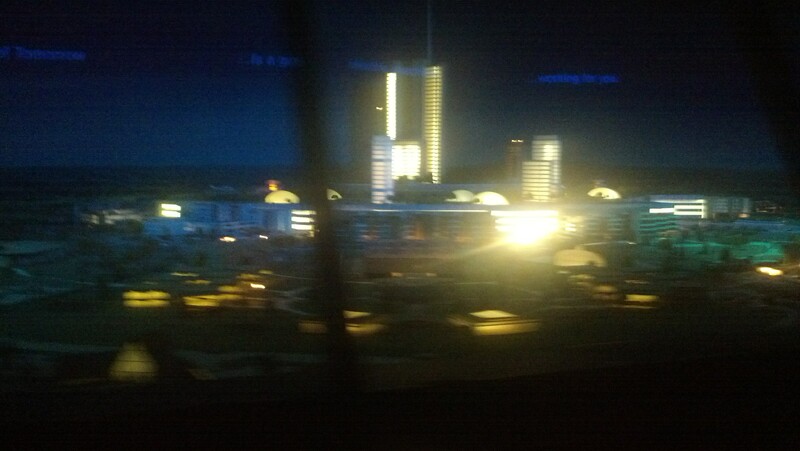 You got a great tour of Tomorrowland on the People Movers! 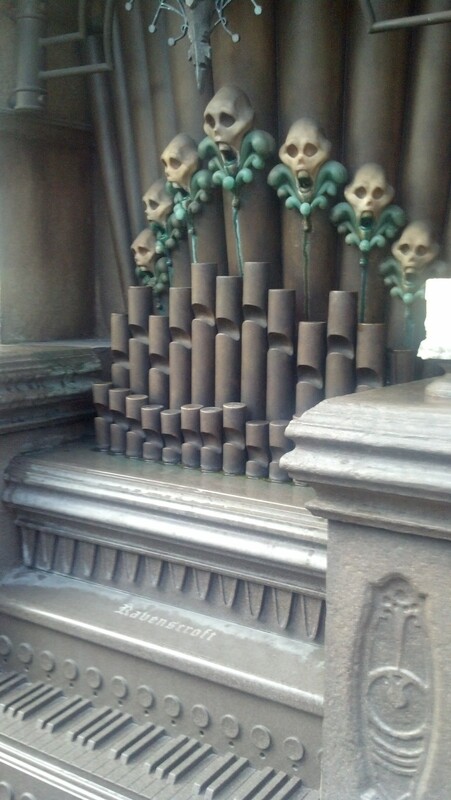 That would have been our last attraction at the Magic Kingdom and on our trip. 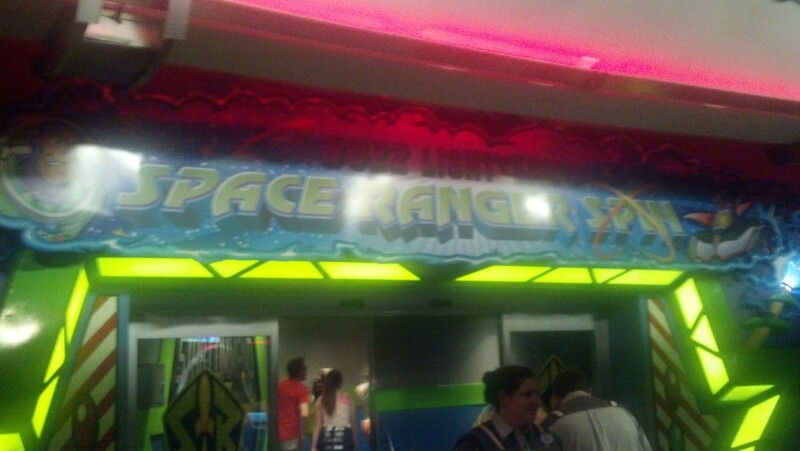 However, the wait at Buzz Lightyear Space Ranger Spin was really short. So, we decided to make this our last attraction of the trip instead. 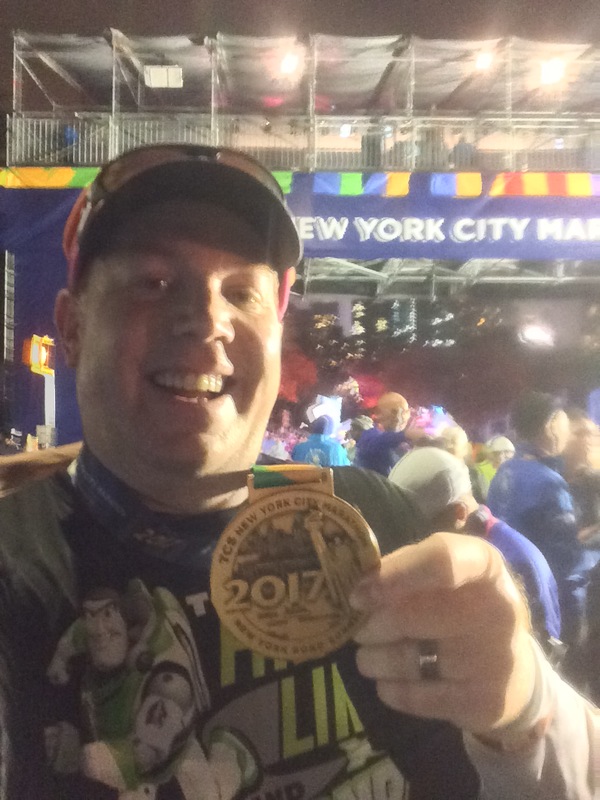 Since I ran the Walt Disney World Marathon as Buzz Lightyear, it seemed to be a fitting end to the Walt Disney World Marathon Trip. Thanks Buzz for your inspiration and keeping me safe during the marathon! 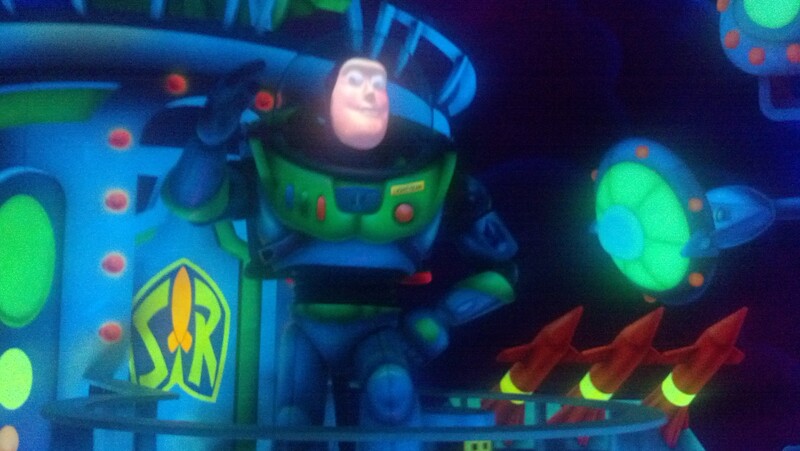 I still prefer the Buzz Lightyear ride at Disneyland because you can pick up the guns and it’s easier to pull the trigger rather than pushing the button on these guns. It is still fun to do. Being the Buzz fan I am, it was too hard to resist. By the end of the ride, however, Brooke and I were beat and hungry. Unfortunately, the restaurants were closed. So, we decided to take the bus back to our resort and have a really late dinner there. I bought the pizza and brought it to our room and we ate in for our last meal. Sorry that these reports have been so long. Even though, I’ve included lots of pictures with each report, trust me when I say that there are many, many more. If you want to see them, I’ll be posting them some time next week under a new “Walt Disney World Marathon Trip” tab that will pop up. So, keep you eyes peeled for that next week. This tab will include links to all of the blog posts I’ve composed about this trip and I have put them in the order that they occurred on the trip. If you’ve been following along, you know that I didn’t post them all in chronological order. So, this tab will keep the entire trip in one easy to find location. Additionally, I’m preparing one last blog post for tomorrow that wraps up the entire trip. I don’t normally post on Saturdays. However, I am ready to move on past this trip.